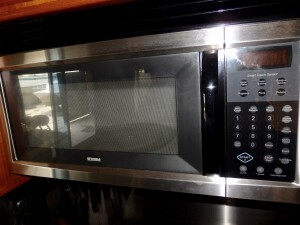 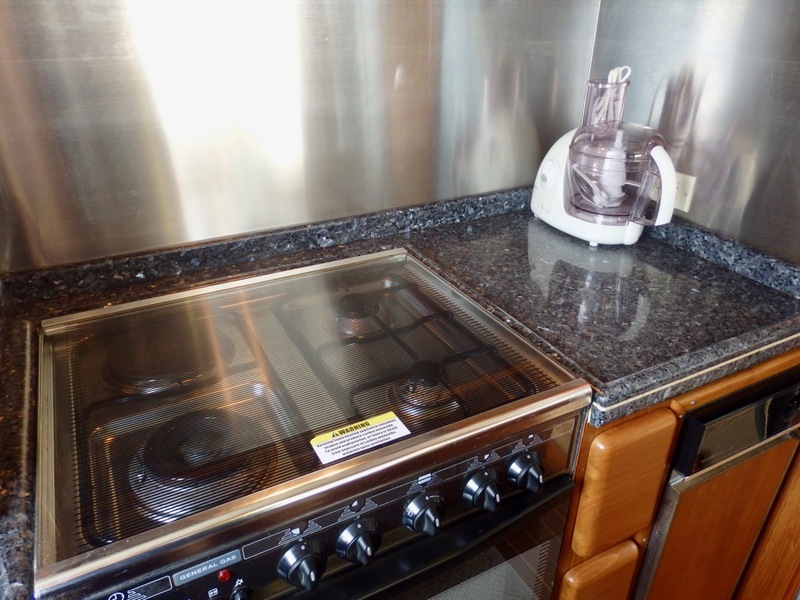 NOW REDUCED! 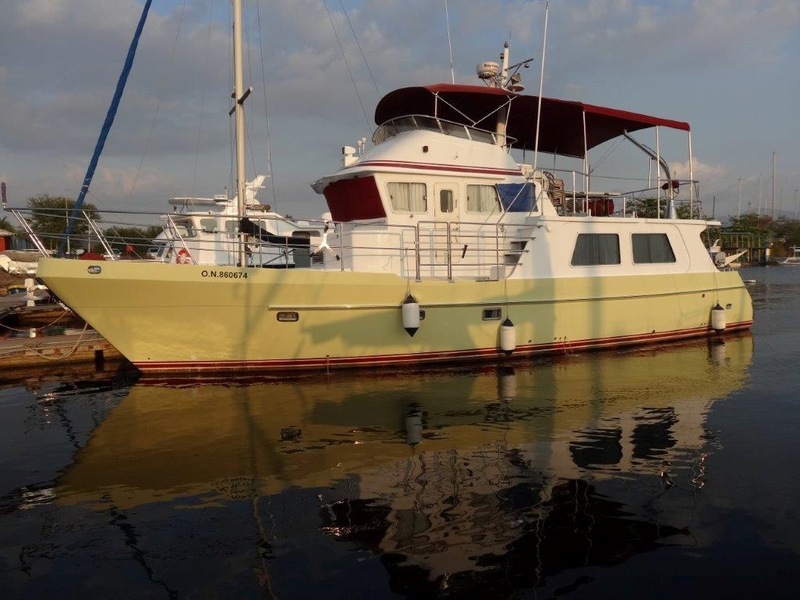 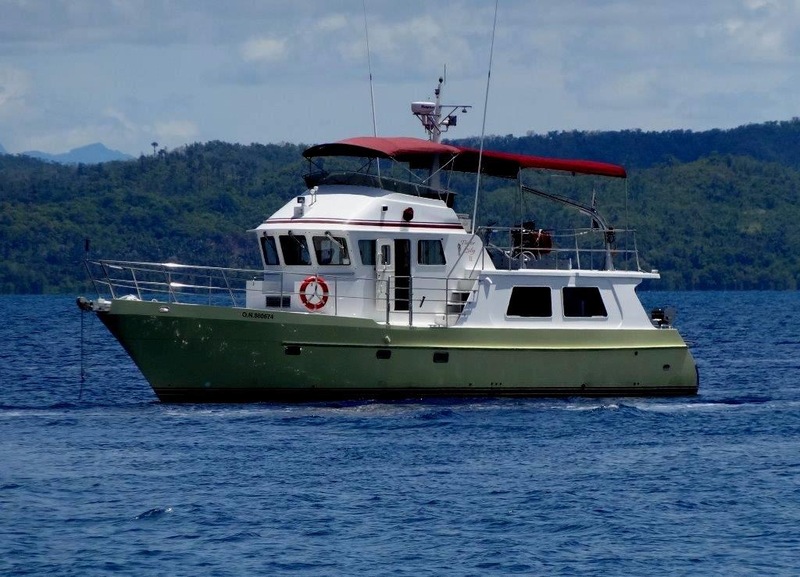 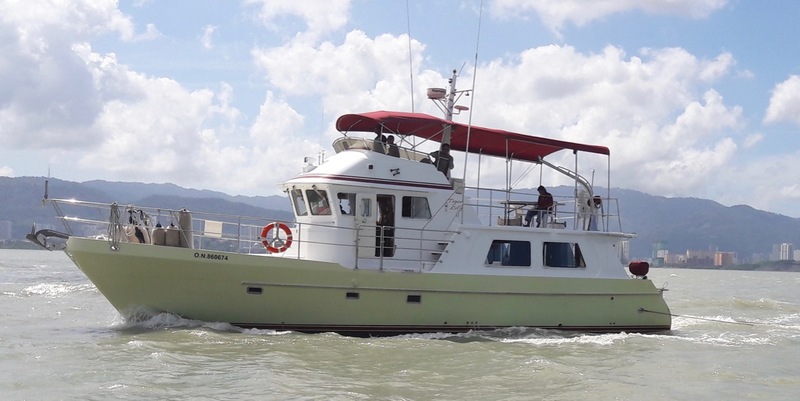 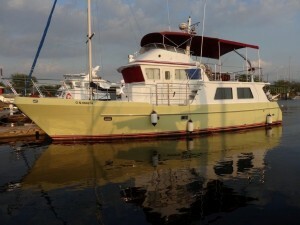 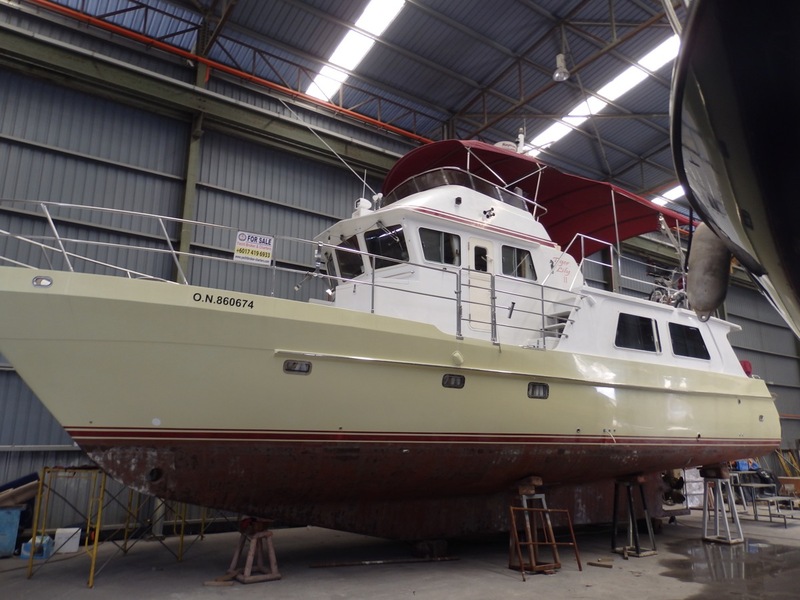 YOUR CHANCE TO ACQUIRE A TRULY SPECTACULAR EXPEDITION-TYPE TRAWLER FAR BELOW MARKET PRICE. 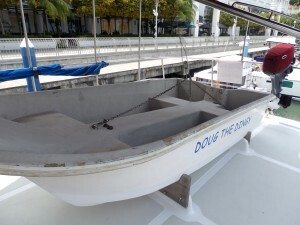 ONE OWNER. FULLY EQUIPPED FOR LIVE-ABOARD OR LUXURY LONG-RANGE CRUISING. IMMACULATELY PRESENTED. Designed by the renowned Blaine Seeley and built to exacting standards by Seahorse Marine in 2007, this magnificent long-range cruiser offers the best of both worlds, with her luxurious accommodation and fit-out, combined with a full keel, semi-displacement hull suited to open ocean conditions. 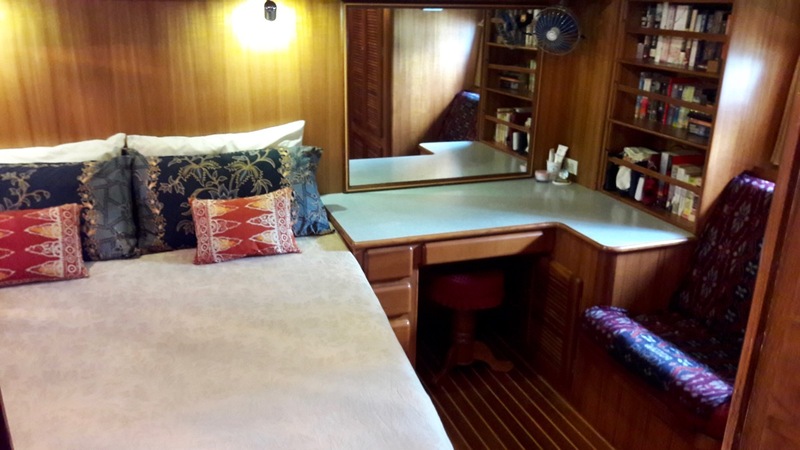 Blaine Seeley has been acclaimed around the world for his seaworthy designs, which combine the lines of the classic long-range trawlers of northern western USA with the muscles of a navy ship, whilst offering a layout suited to the demands of modern day explorers. 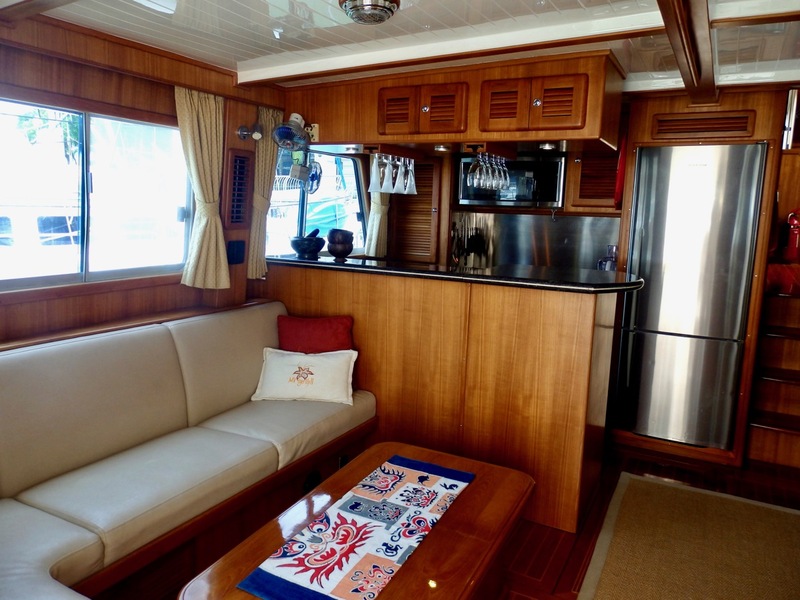 Tiger Lily II’s interior can only be described as luxurious, with a hand-crafted solid teak fit-out, granite counter tops, high quality stainless steel trims and rich leatherette upholstery. 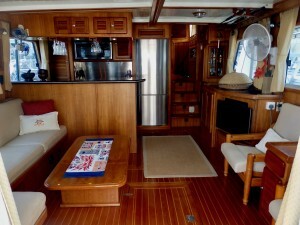 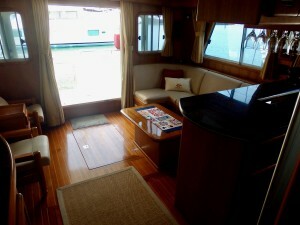 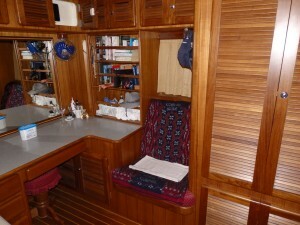 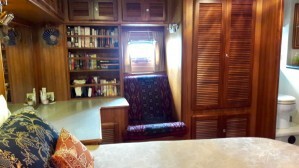 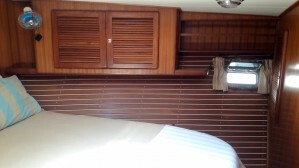 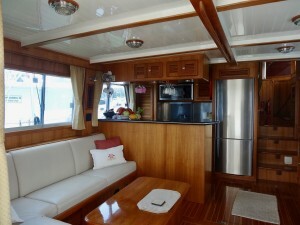 Saloon and galley are on the same open plan. 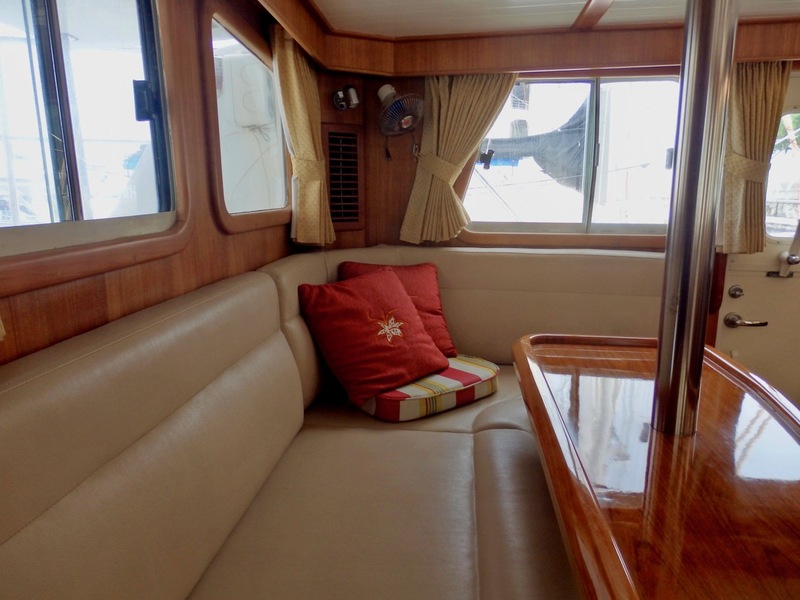 This beautifully appointed saloon / lounge is generously proportioned and perfect for relaxing or entertaining, with all-around views over the water, plenty of natural light and easy access to the outdoors. 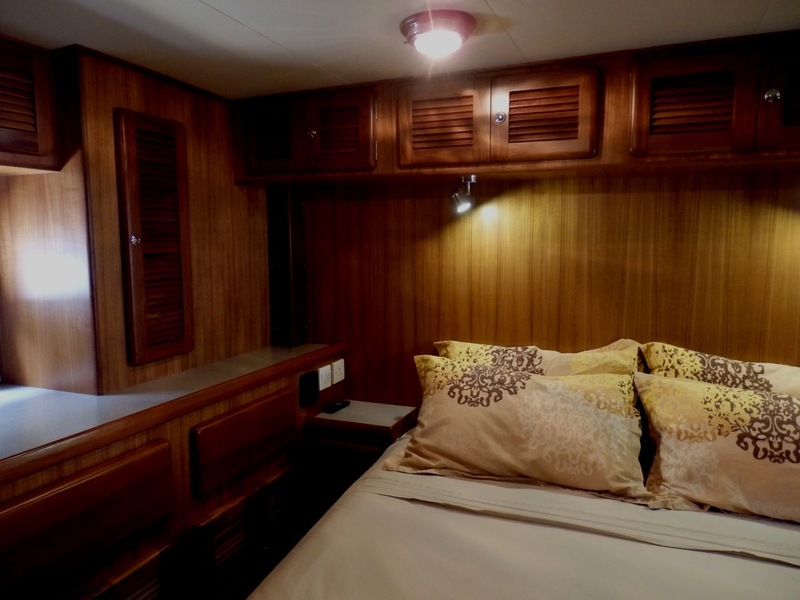 The master cabin is designed to offer a haven of comfort and relaxation, with accent lighting, tasteful furnishing, and abundant storage. 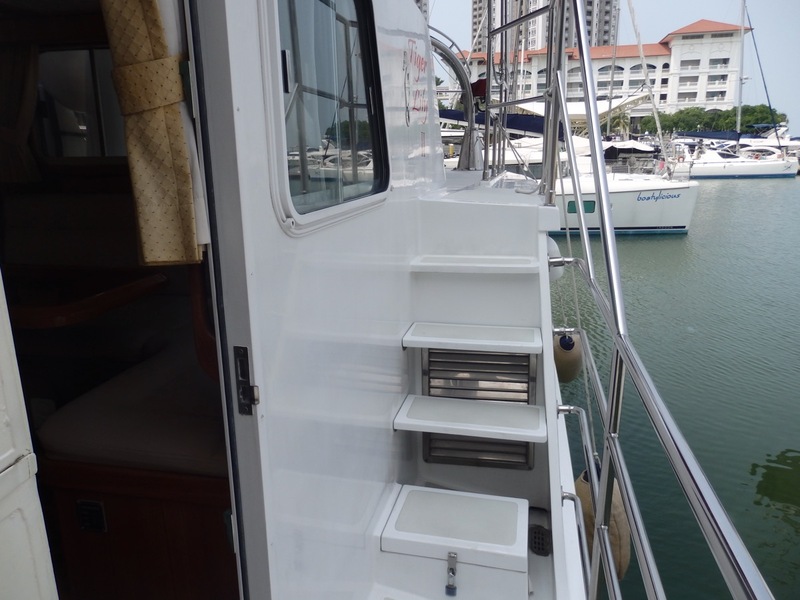 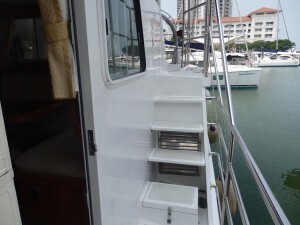 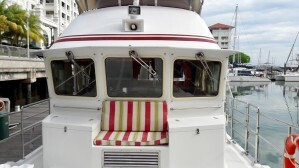 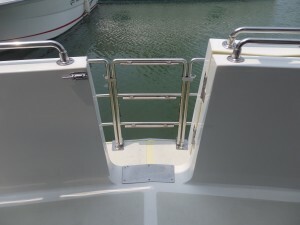 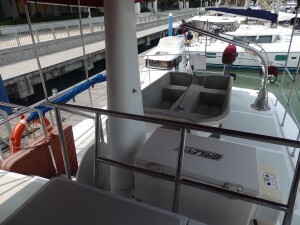 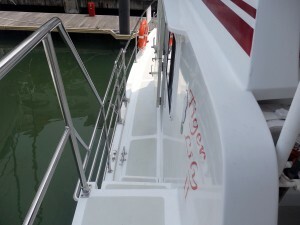 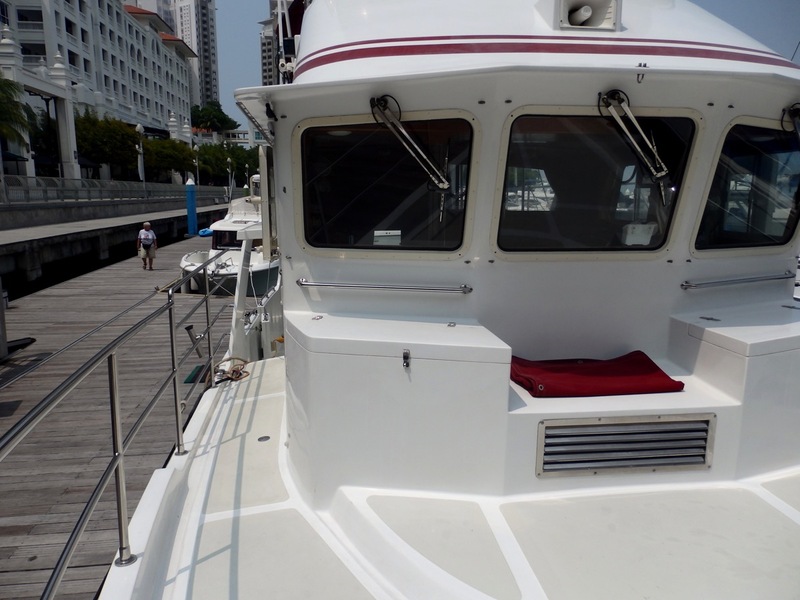 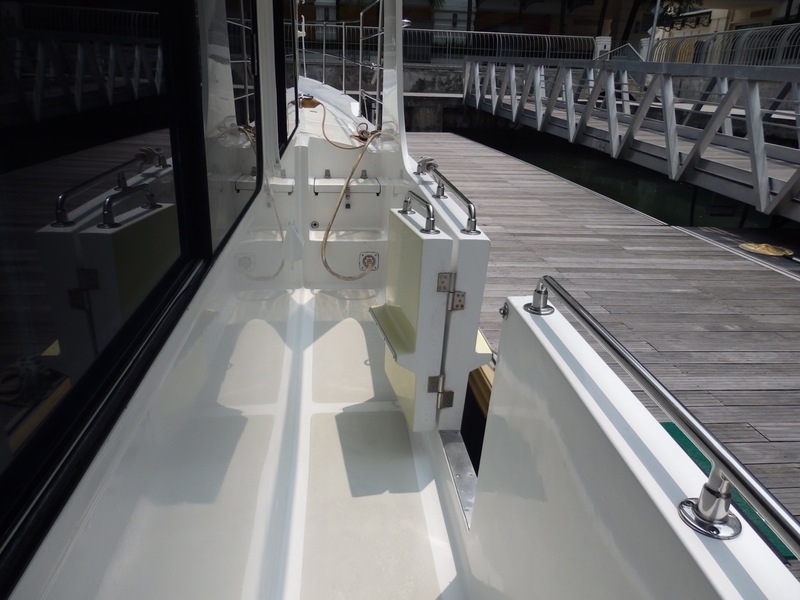 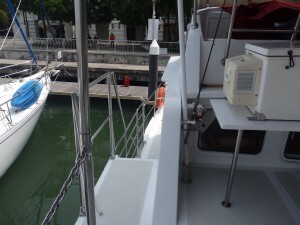 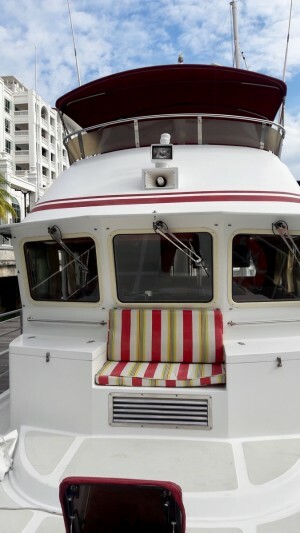 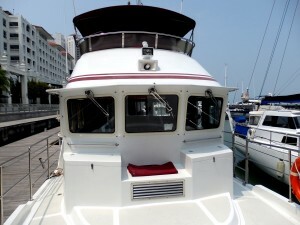 Step aboard at the starboard boarding gate and you have that instant trawler feel, the secure sidewalk leading forward or aft to the comfortable cockpit where you have easy access to the water via the railed transom. 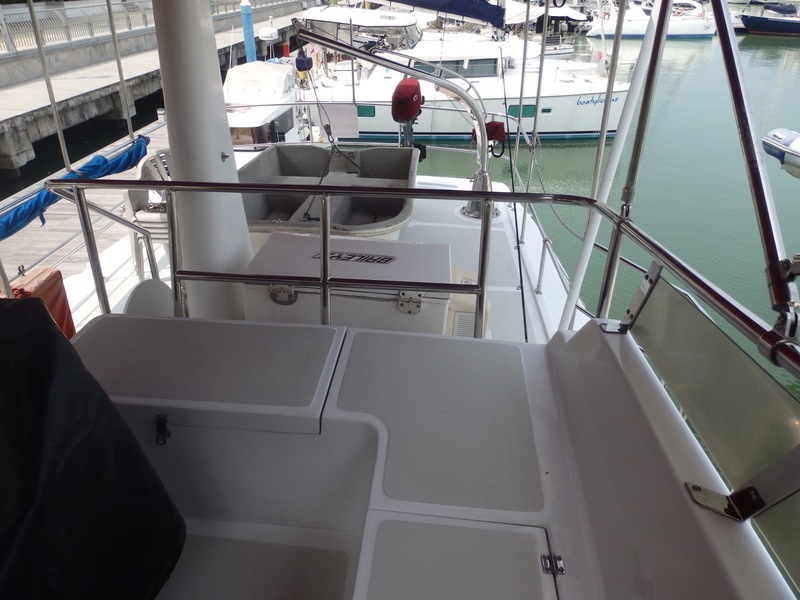 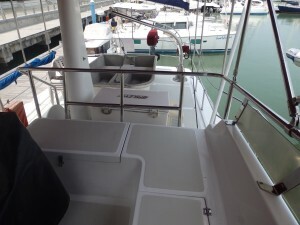 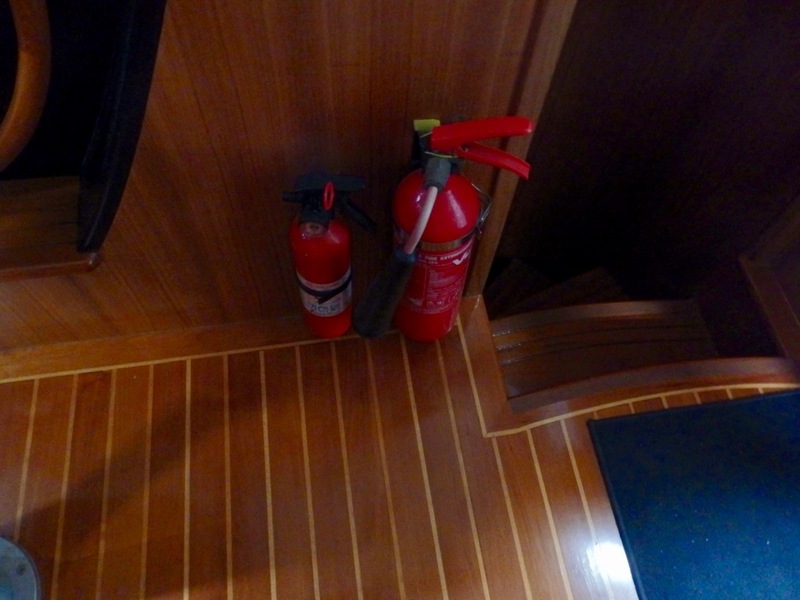 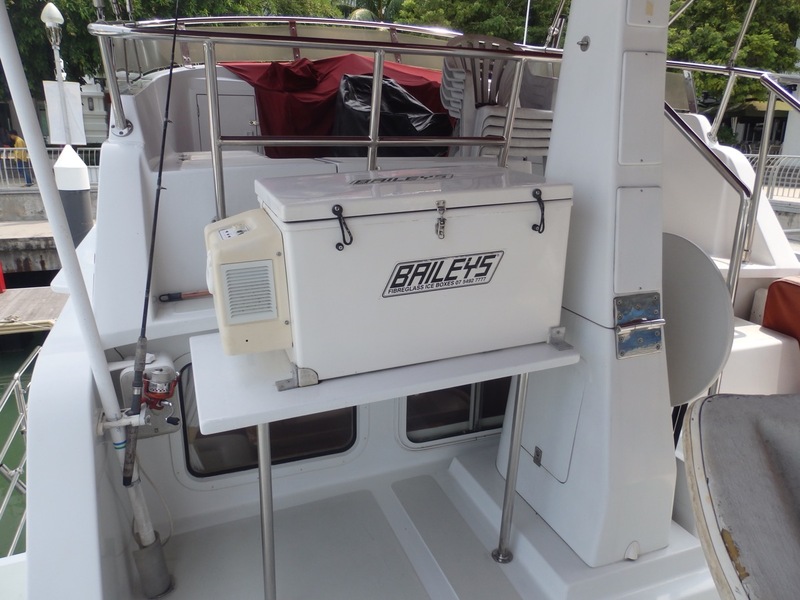 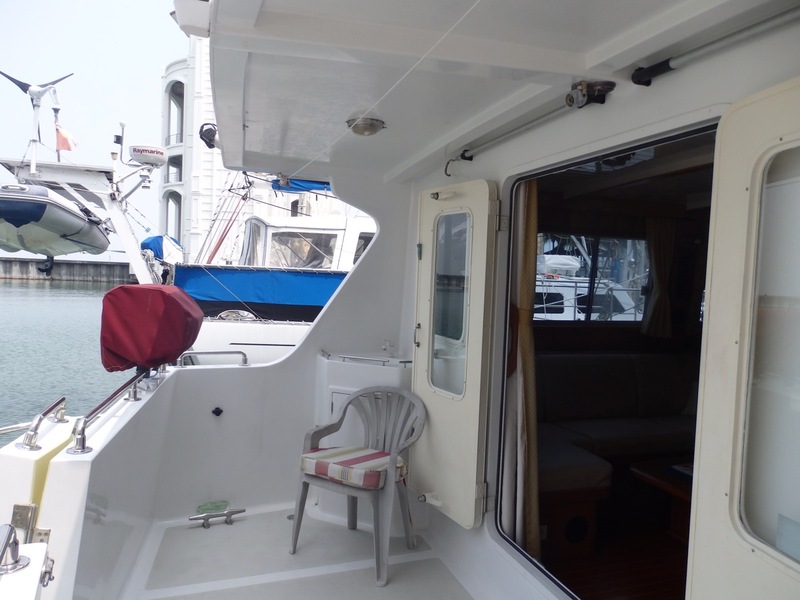 Upstairs, the flybridge provides yet another huge entertaining area, with a dedicated dinghy stowage space complete with electric crane for easy launching and retrieving. 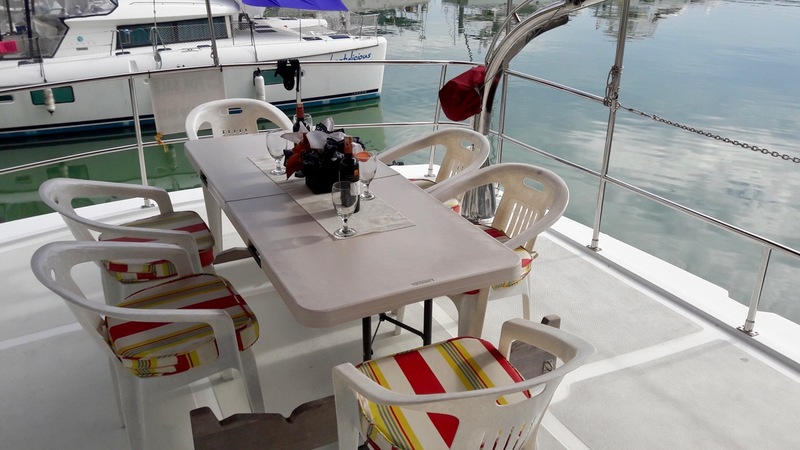 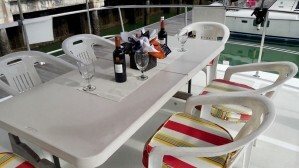 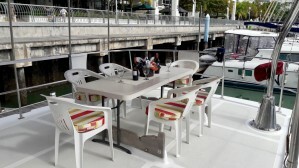 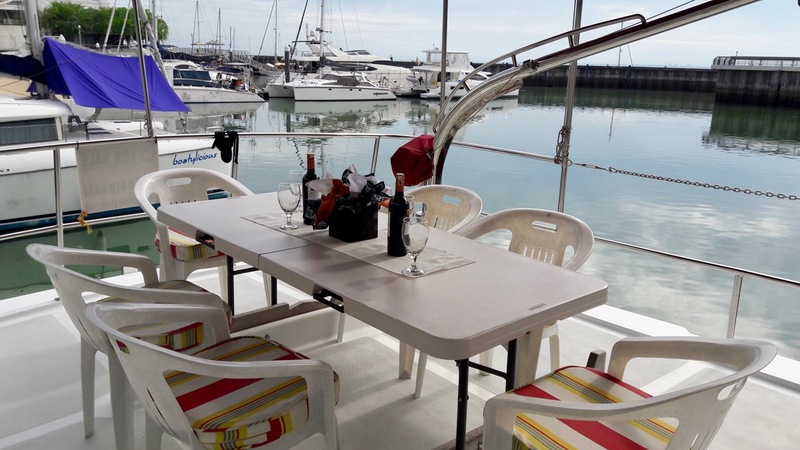 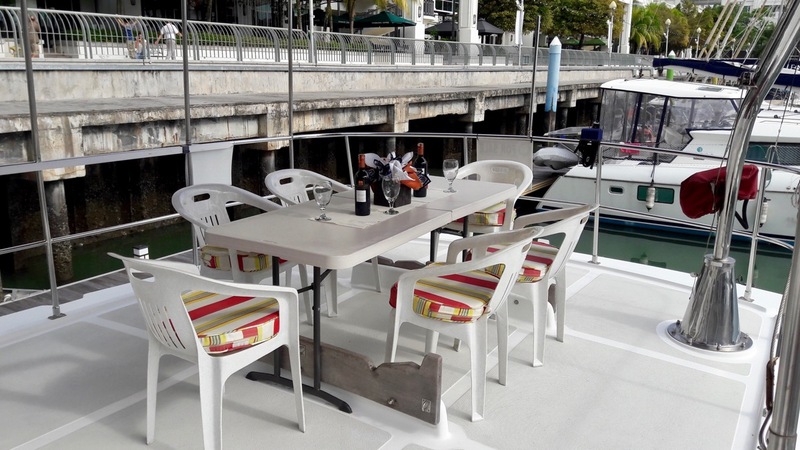 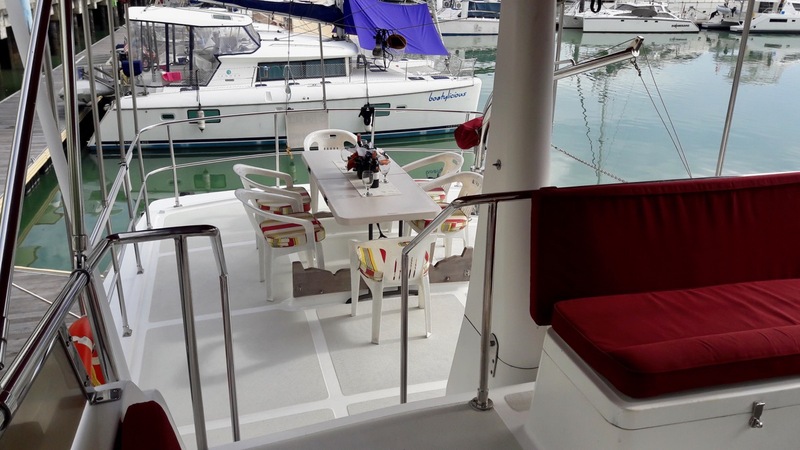 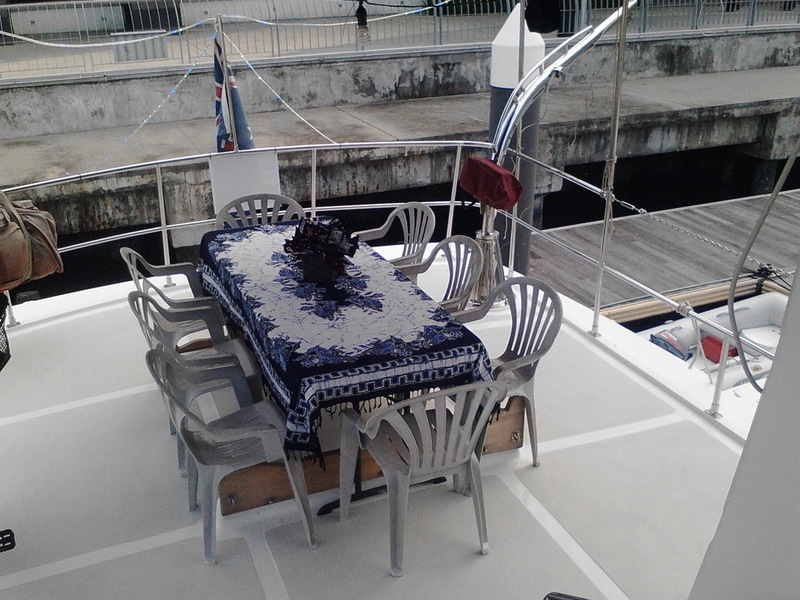 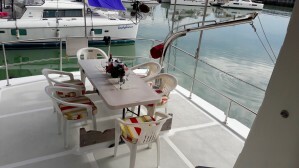 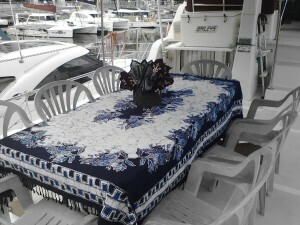 With complete overhead shading and solid stainless steel guardrails, entertaining on this boat deck is a normal event with stackable chairs and a table for eight. 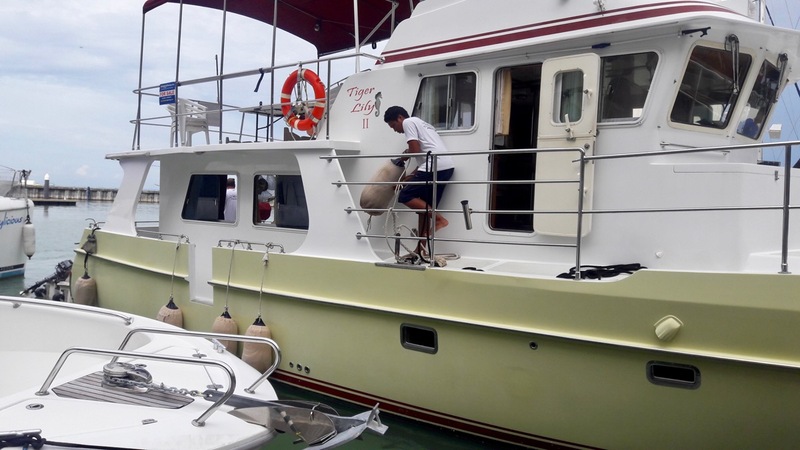 The machinery and equipment on Tiger Lily II is extensive, with sophisticated ancillaries, fuel and oil polishing, fuel consumption monitor, LCD camera monitoring, generator, water-maker, air-conditioning, WEBASTO heating, ice maker, internal vacuum system, washing machine, etc. 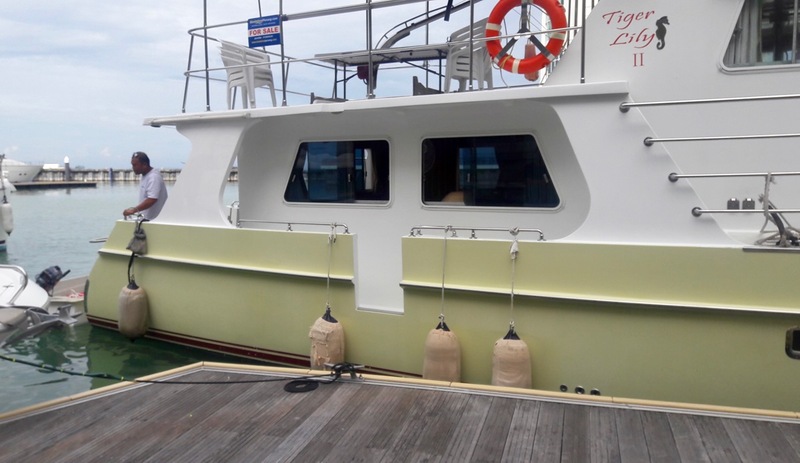 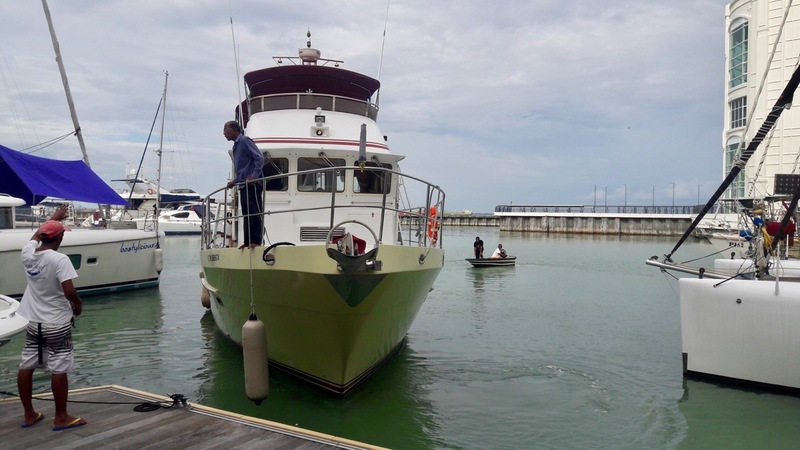 Tiger Lily II is powered by the exceptionally quiet John Deere 6068 TFM75 which provides a comfortable cruising speed of 7 knots, consuming about 1.4 GPH with a range of 2500 nm. Maximum speed is between 9 and 11 knots. 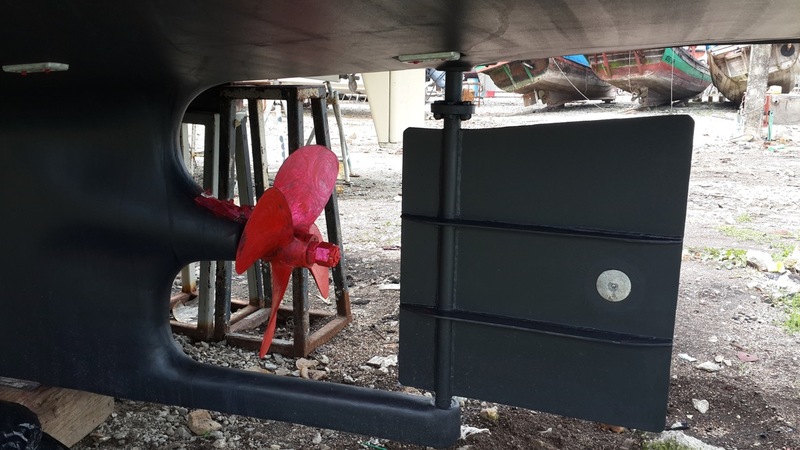 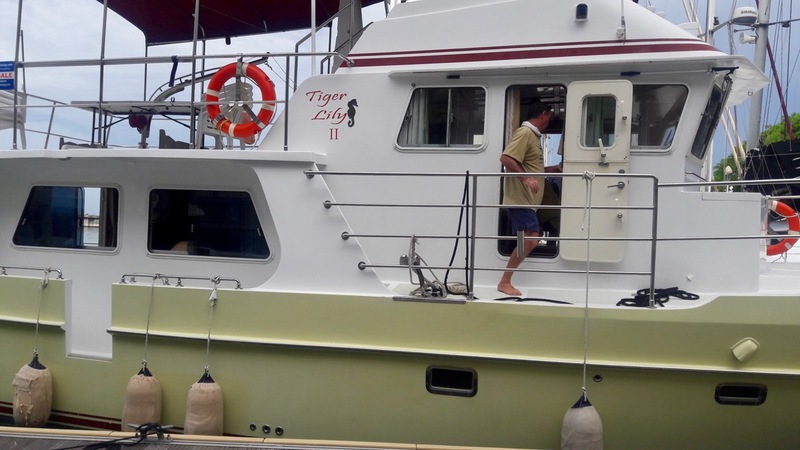 For ease of berthing, Tiger Lily II is fitted with a powerful bowthruster with joy stick control at both steering stations. 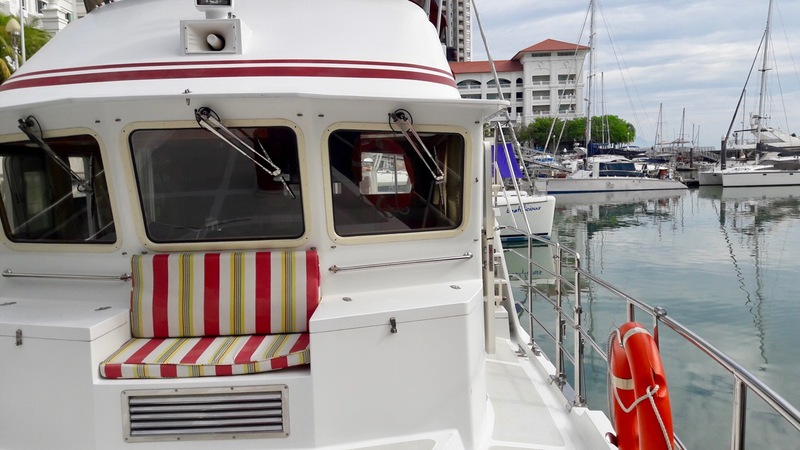 Thus far Tiger Lily’s owners have seen no need for stabilizers in spite of their extensive cruising, which is a credit to this yacht’s stable quality in the seaway. 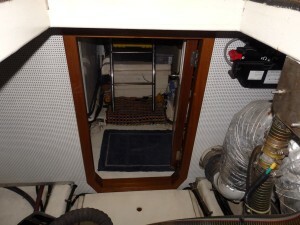 However, should you choose to have them fitted, provisions were made to the hull with the addition of reinforced pads. 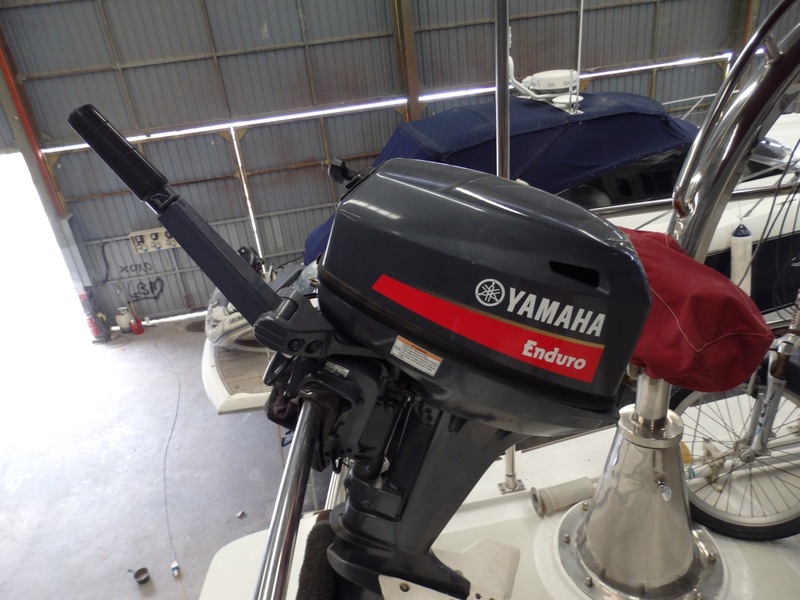 1) 850L three tank fuel system incorporates a fuel polishing system and a priming pump for safety. 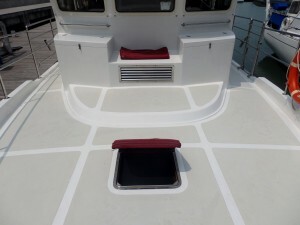 2) Tank venting and filling lines are designed to almost make it impossible to spill any fuel overboard. 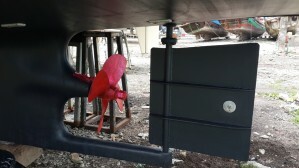 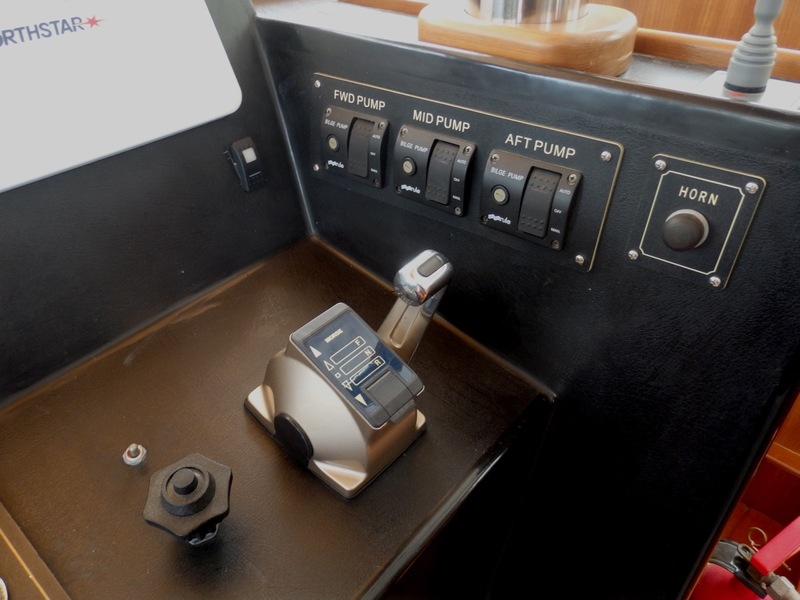 3) An 8KW trodial isolation transformer is standard for electrolysis protection as well as allowing 220 and 110 volt service in the boat and dual voltage dock input. 4) All inlet thruhulls are located in one sea chest to cut the number of holes in the hull. 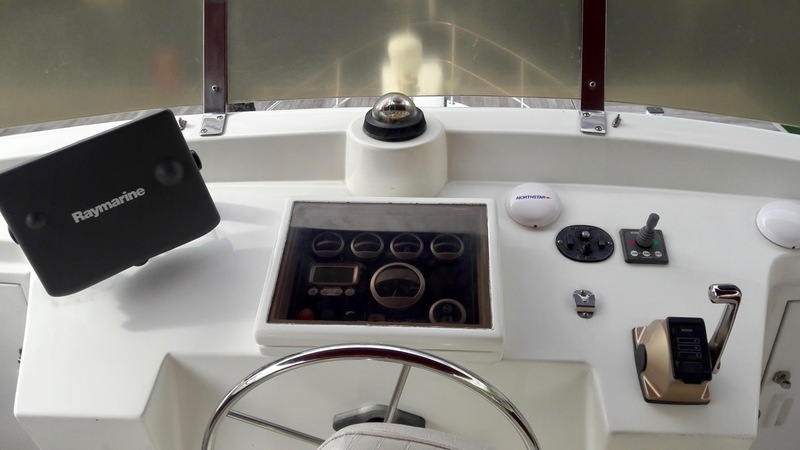 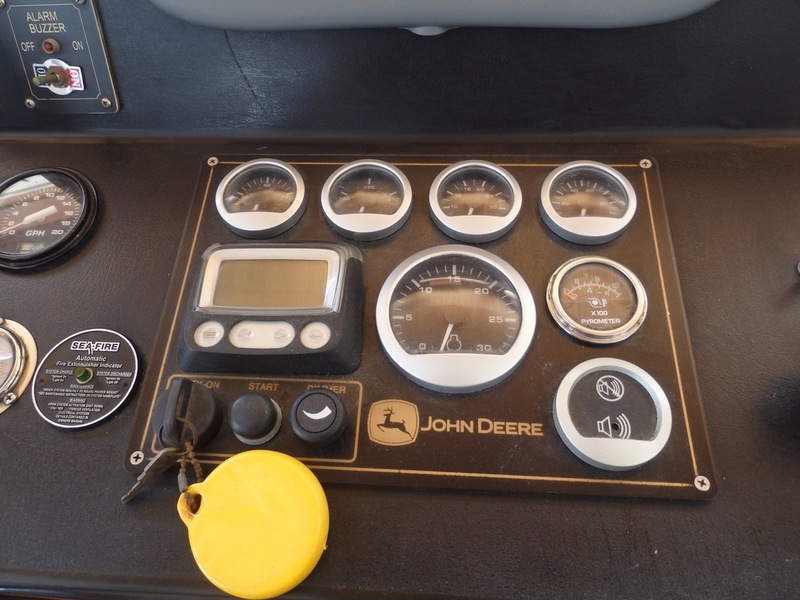 5) Dash safety Systems Monitor uses visual and audio warnings to tell the person on watch the status of every system in the boat including high engine room temperature, high bilge water, engine water flow, and any pump running. 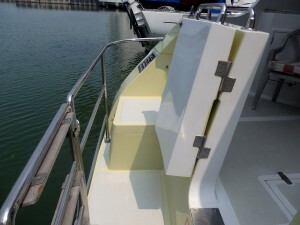 6) Unique "log knocker" prop protecting skeg is great for areas with a lot of logs or debris in the water. 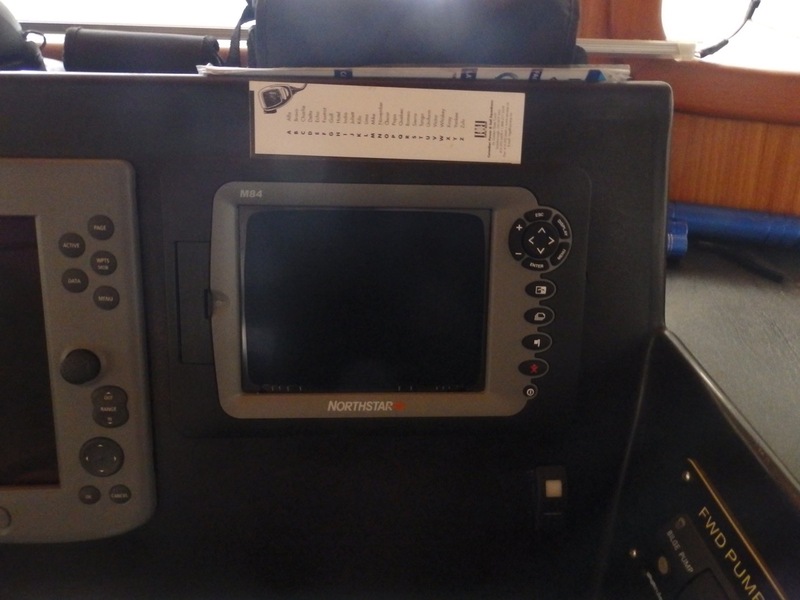 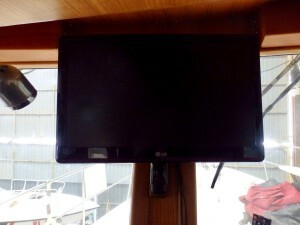 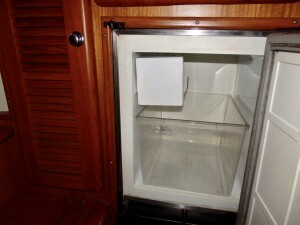 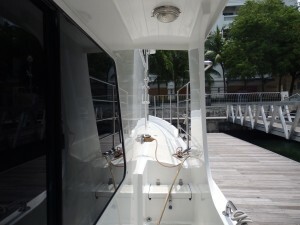 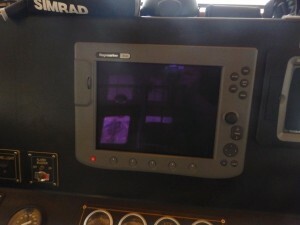 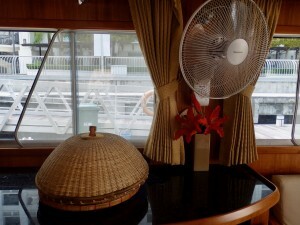 7) All windows have aluminum frames with screens and the pilothouse windshields are 10MM thick. 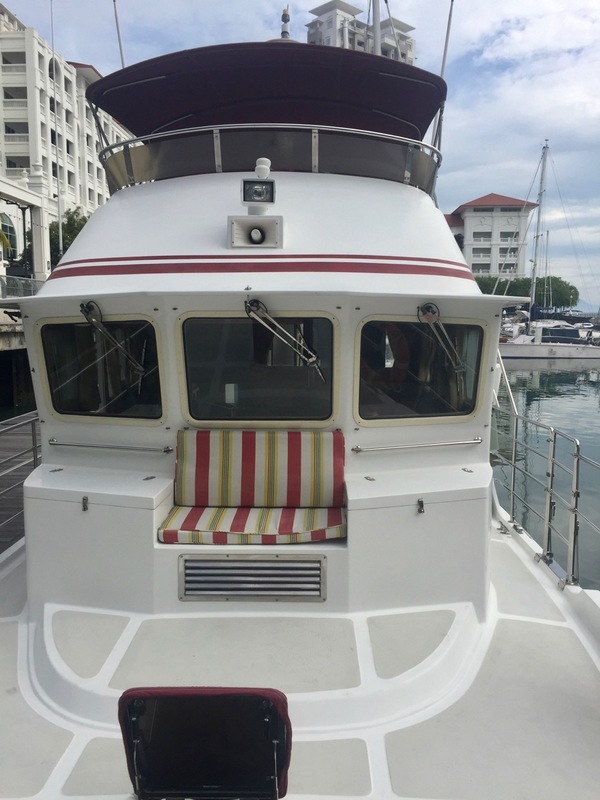 For more information on Tiger Lily II or to arrange for an inspection please call or email our friendly team at Nautilus Yacht Management. 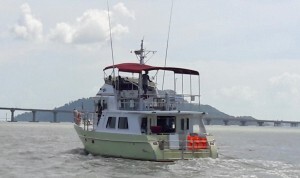 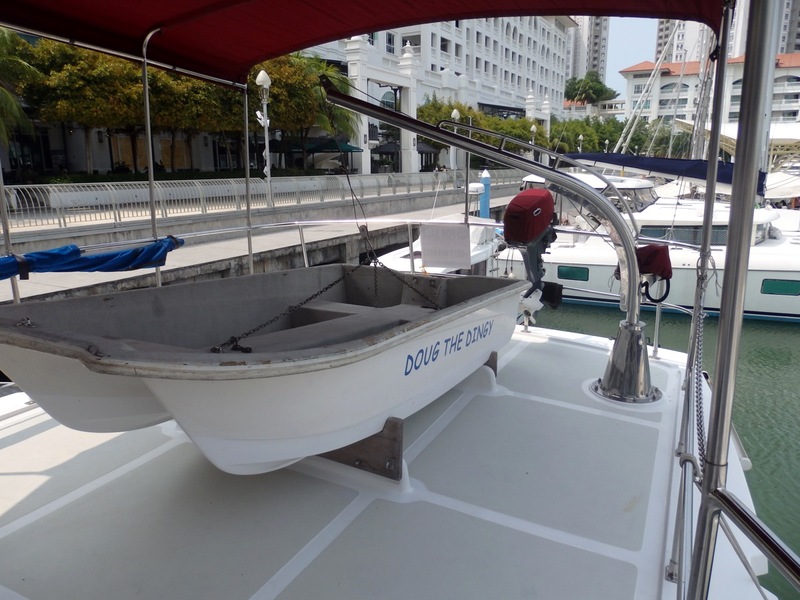 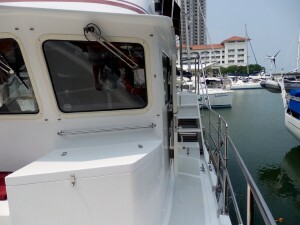 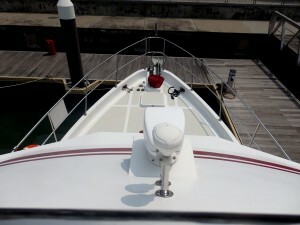 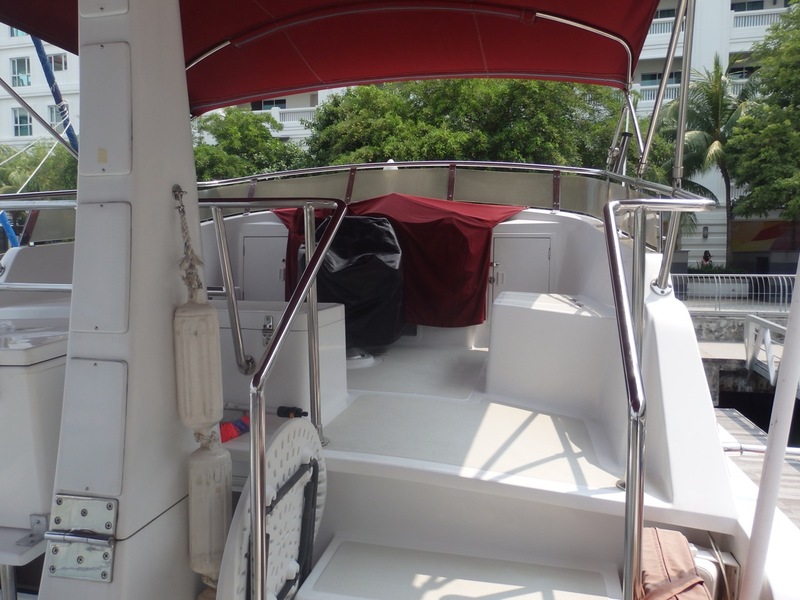 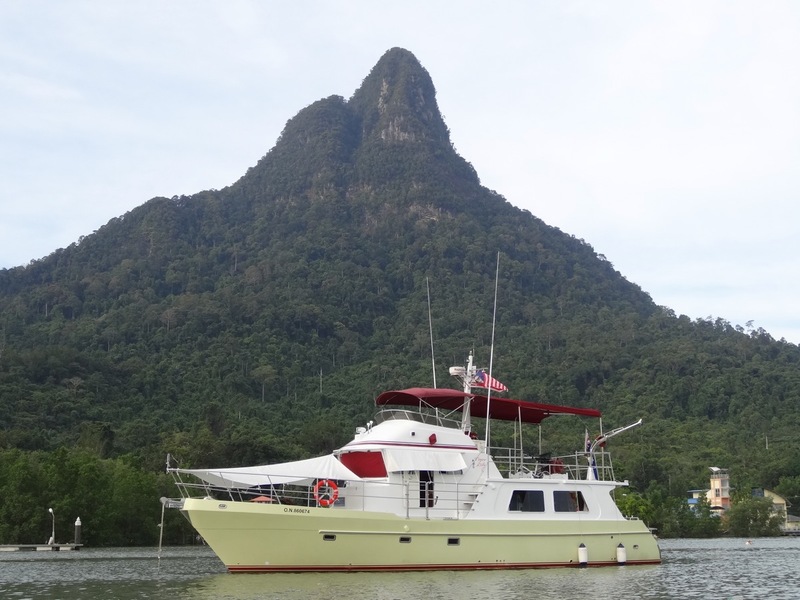 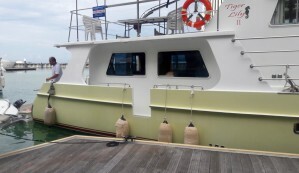 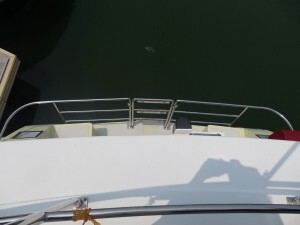 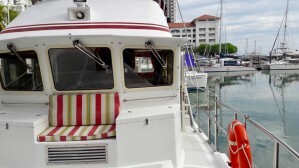 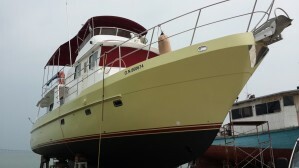 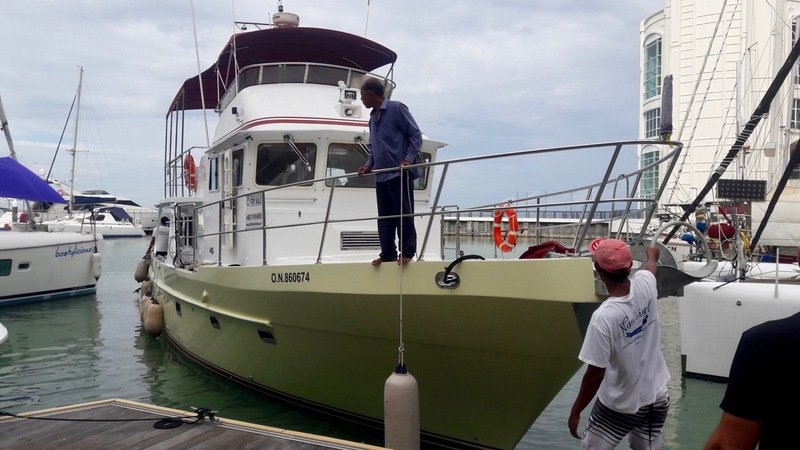 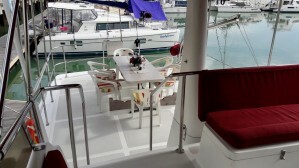 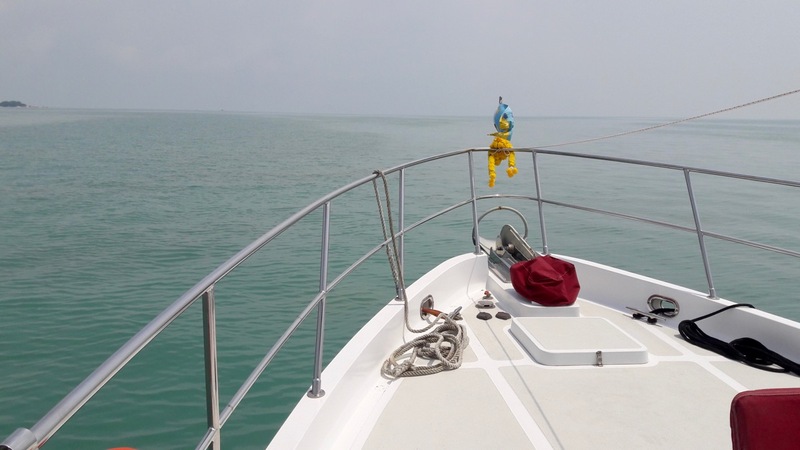 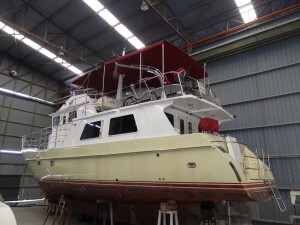 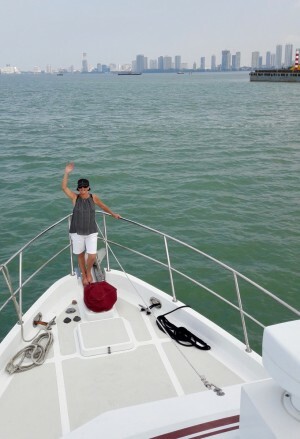 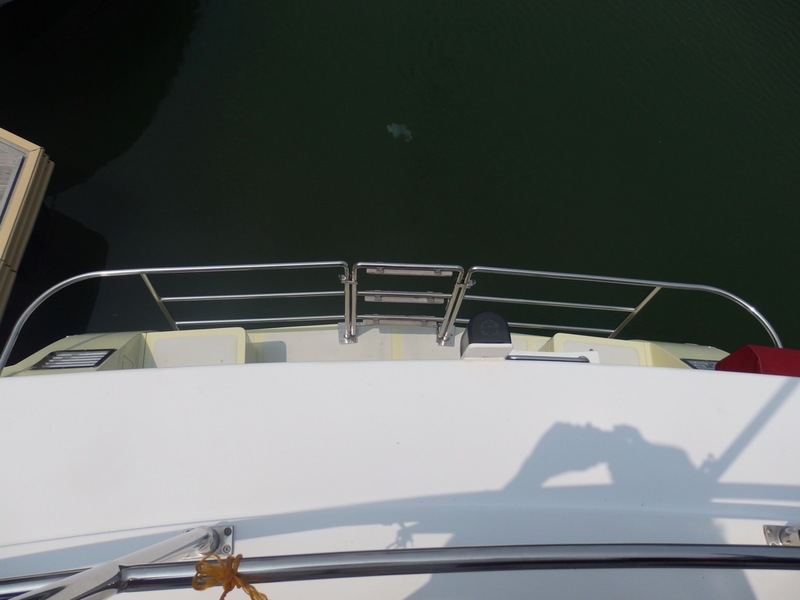 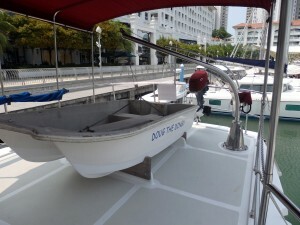 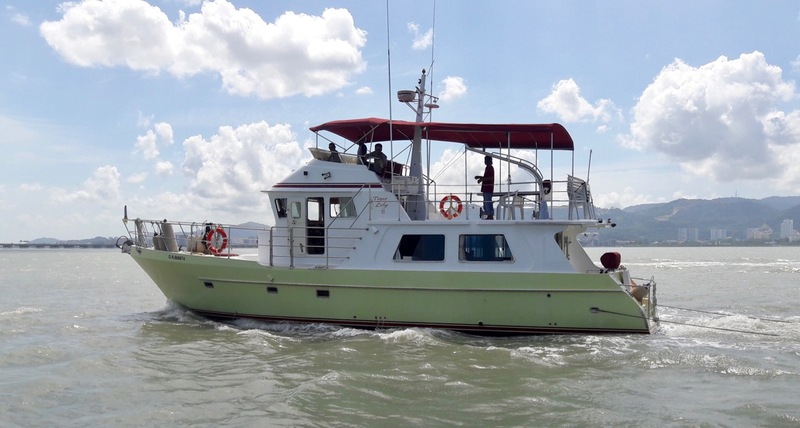 The yacht is presently located in Malaysia, where the owners would be delighted to show you through the boat and answer directly any questions you may have. 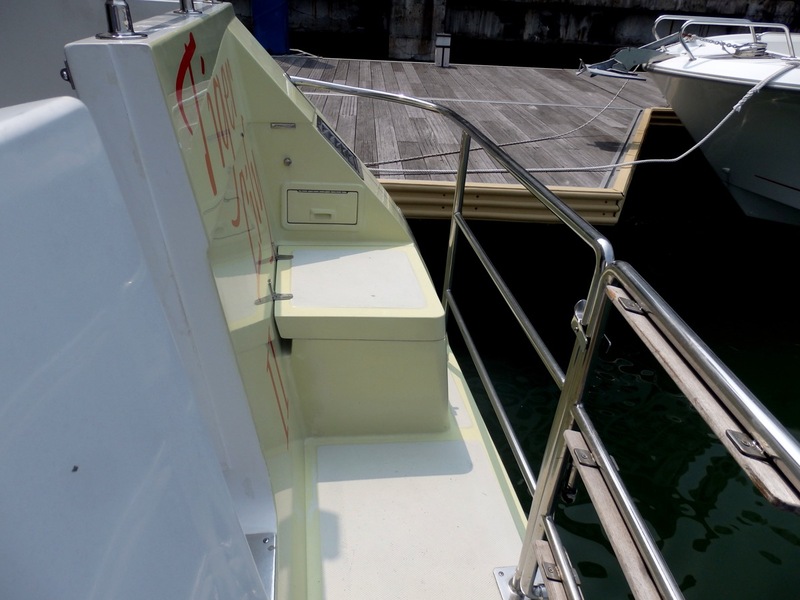 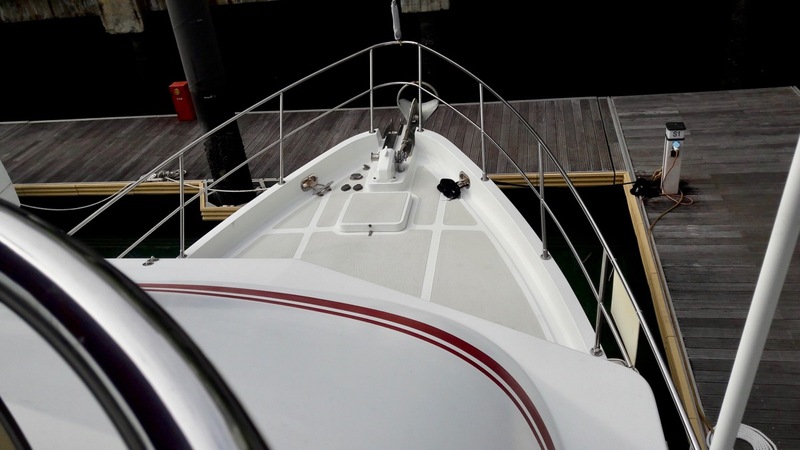 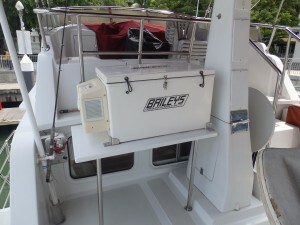 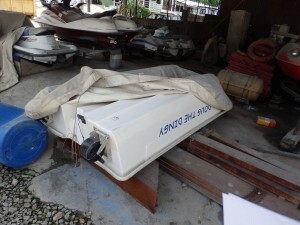 FIY, yachts can be purchased in Malaysia without attracting sales taxes. 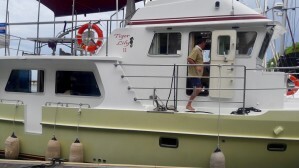 Tiger Lily II is an Australian flagged vessel. 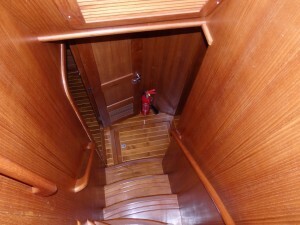 Entering the boat from the swim platform there are many notable details. 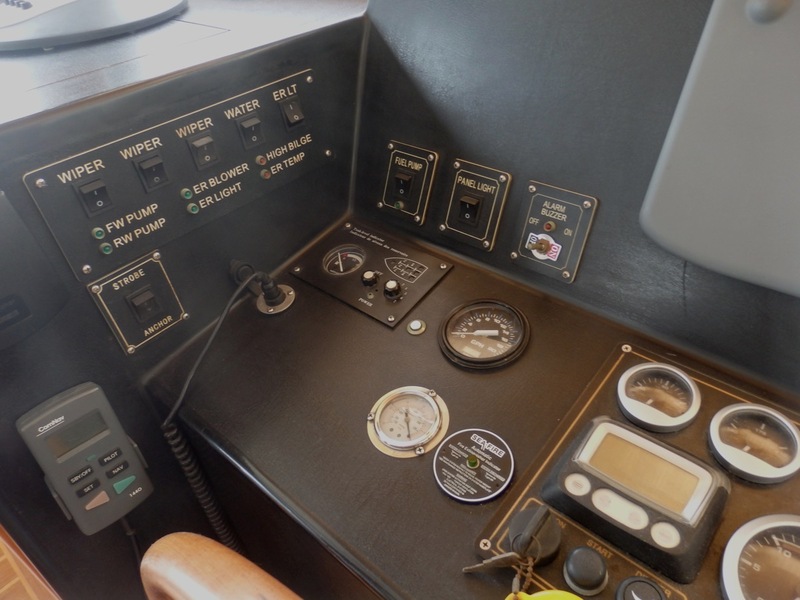 The platform itself is integral to the hull, with a hot and cold shower and features a stainless steel guard rail with a gate for accessing the tender - note that overhead lights are directed to the tender. There are two large built in lockers. 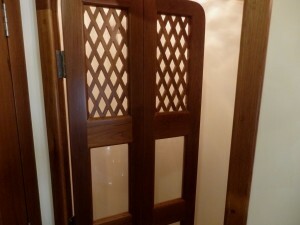 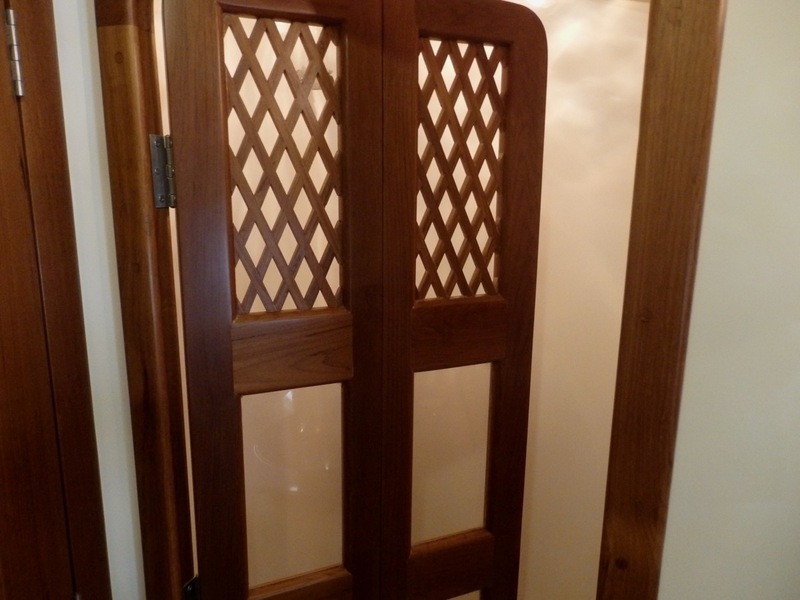 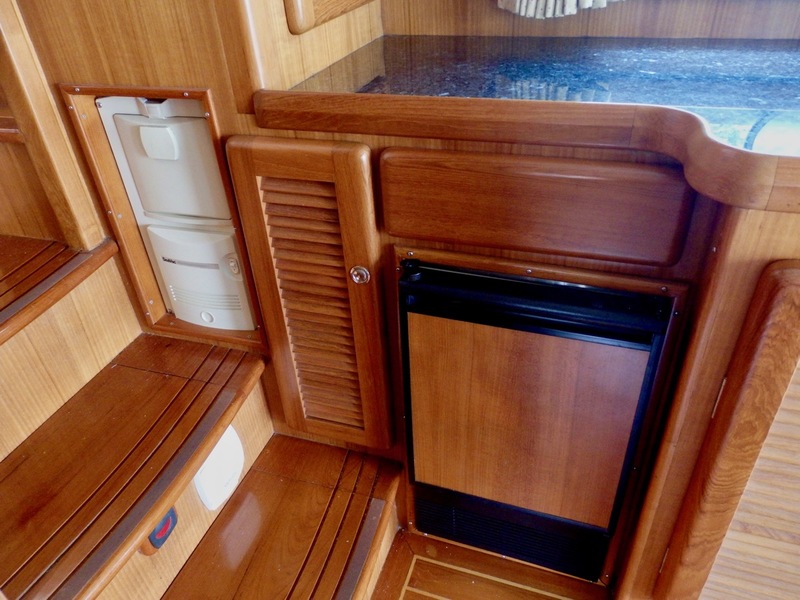 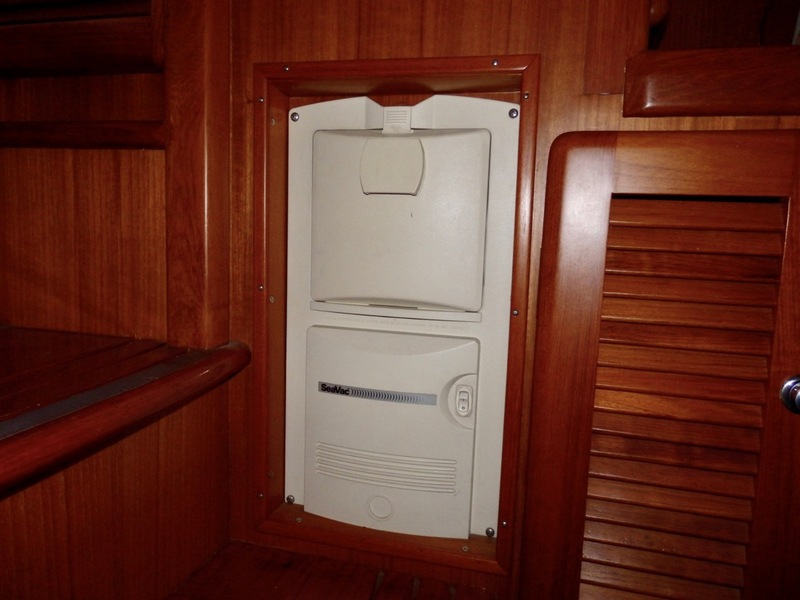 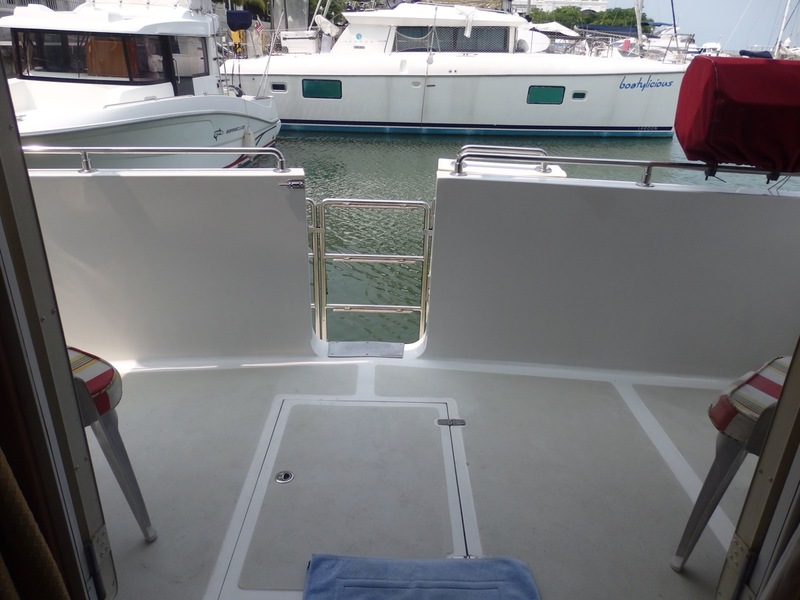 The generous transom door eases access aboard, and the transom has stainless steel guard rails all around. 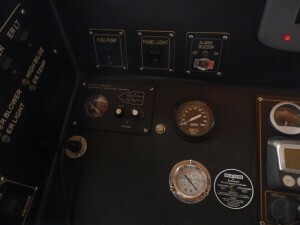 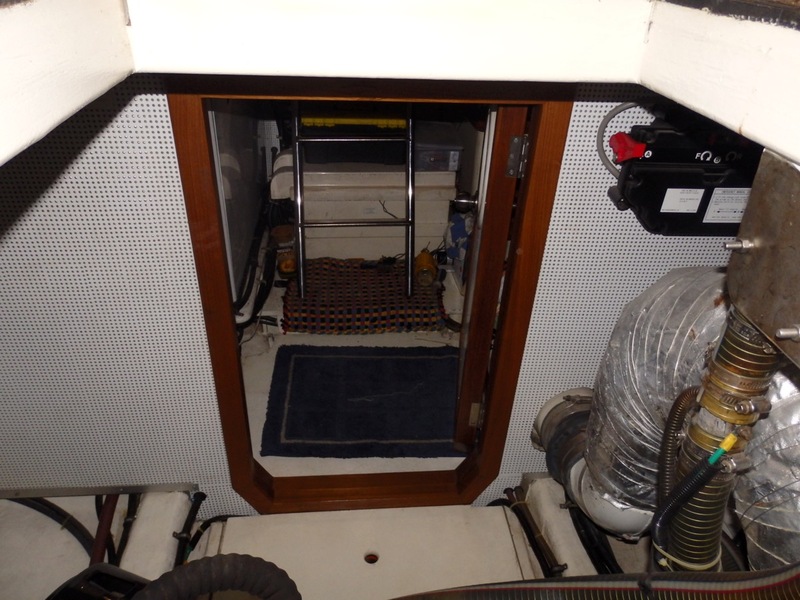 Step up to the cockpit, noteing the hatch leading to the dry and immaculate lazarette, with furnace, and steering gear access. 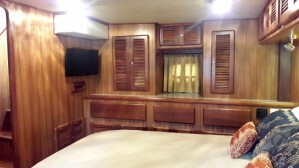 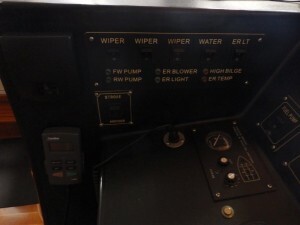 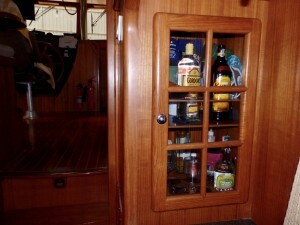 The covered enclosed cockpit features overhead lighting, water hose, and built-in sink/locker to port, a double door to the saloon. 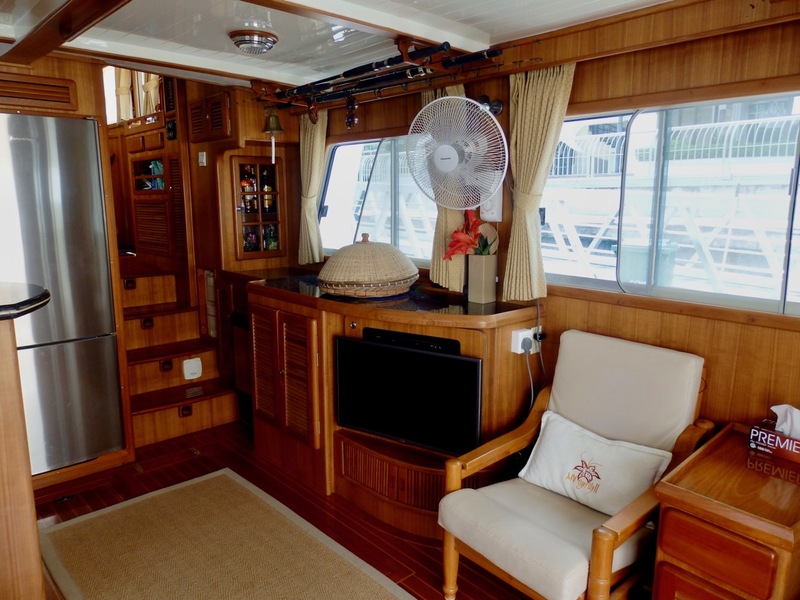 Entering the saloon from the double doors, it is elegant, functional and very comfortable with an L-shaped sofa to port and two armchairs to starboard, all in beige leather with a lift up coffee table which converts to a dining table. The bar area forward to starboard features a glass and bottle cabinet, the ice maker, the laundry unit, the Seavac internal vacuum system and the flat screen TV. 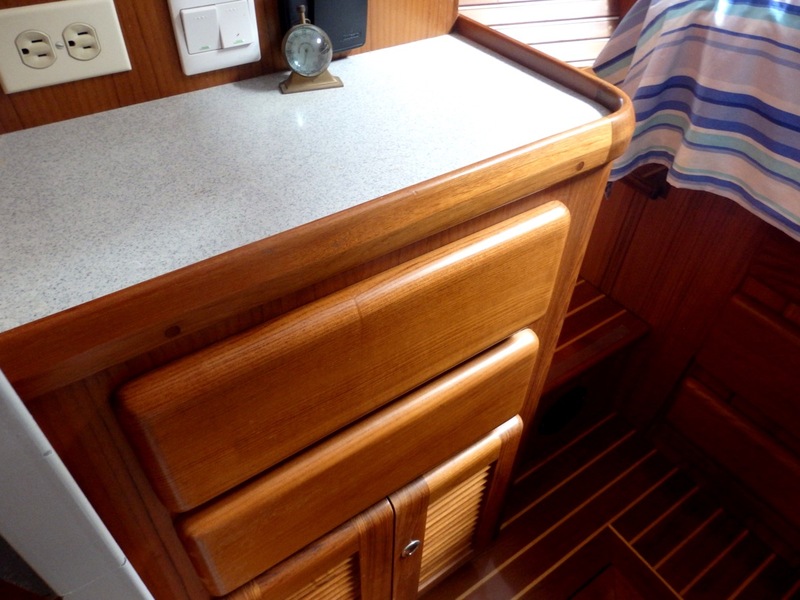 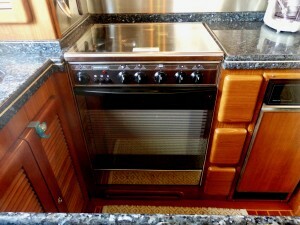 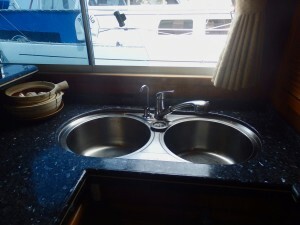 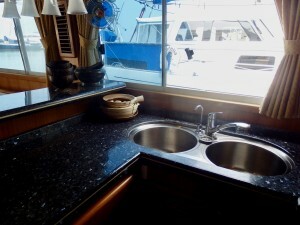 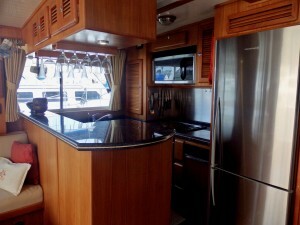 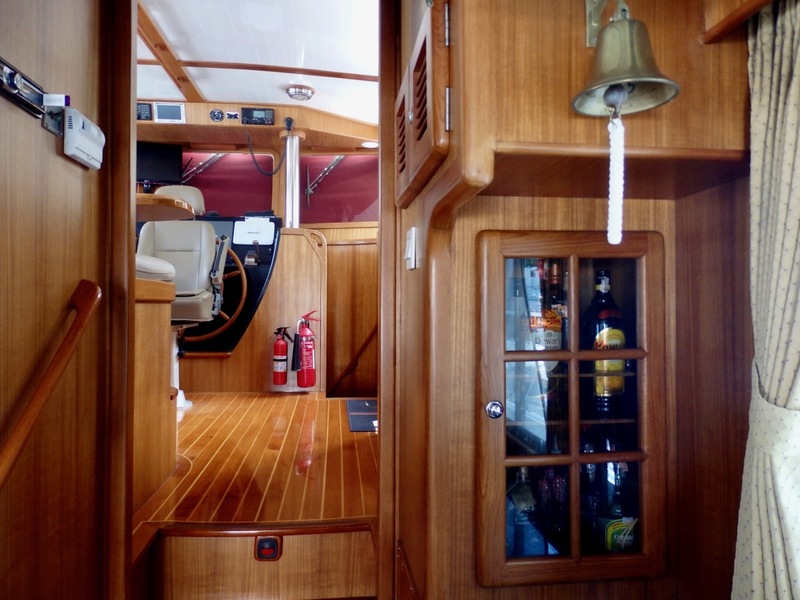 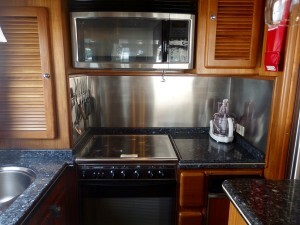 All granite countertops set into solid teak, the raised granite work top opposite adjoins the galley and saloon perfectly. 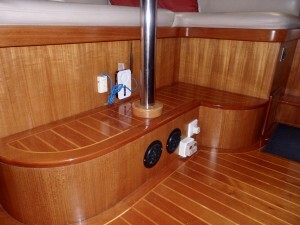 Excellent lighting with accent lighting throughout and a stereo system. 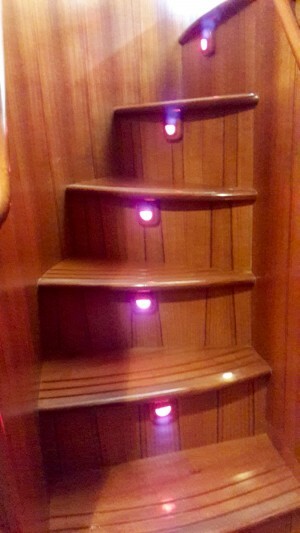 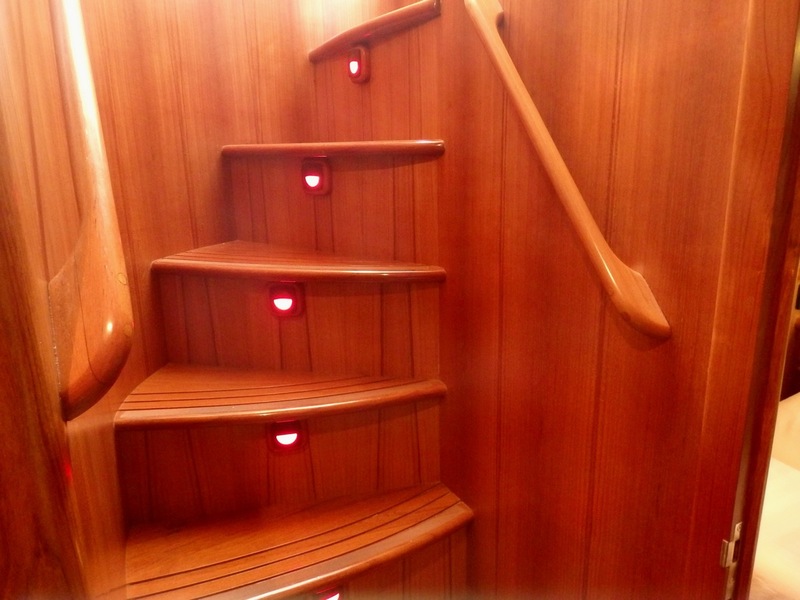 From the pilothouse down the companionway forward, with red courtesy lights and a solid handrail, you have the two luxury cabins. 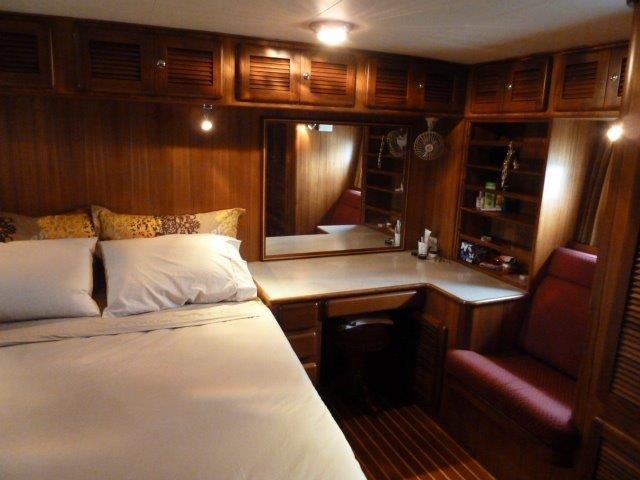 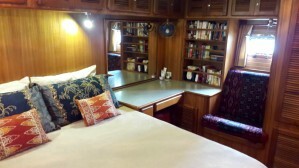 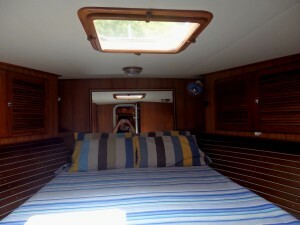 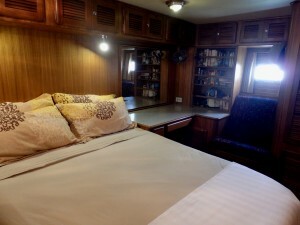 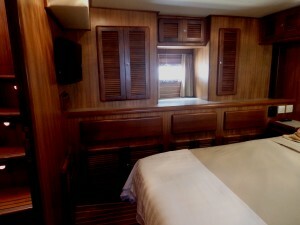 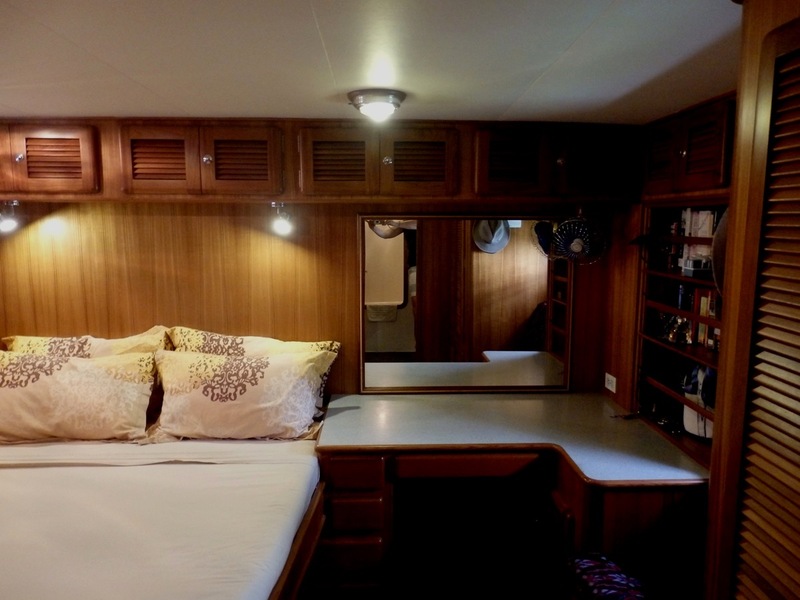 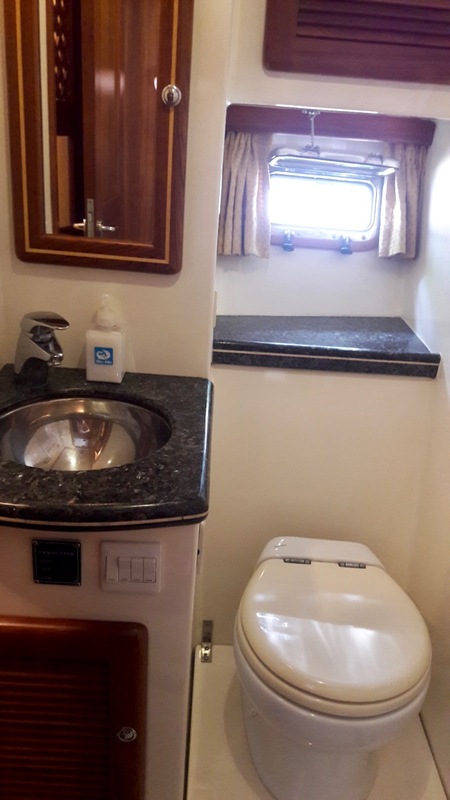 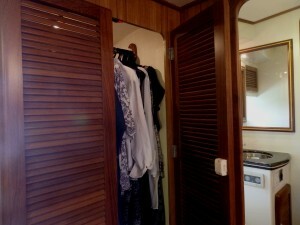 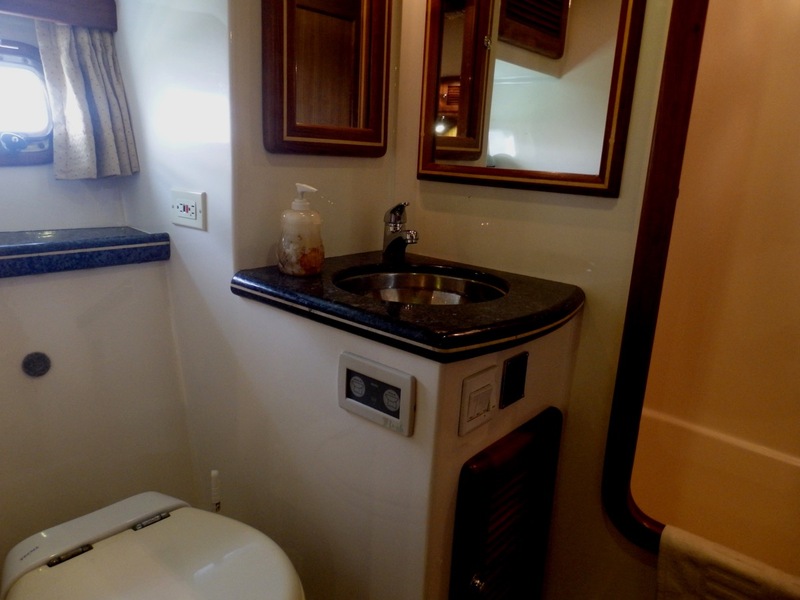 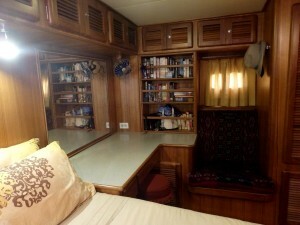 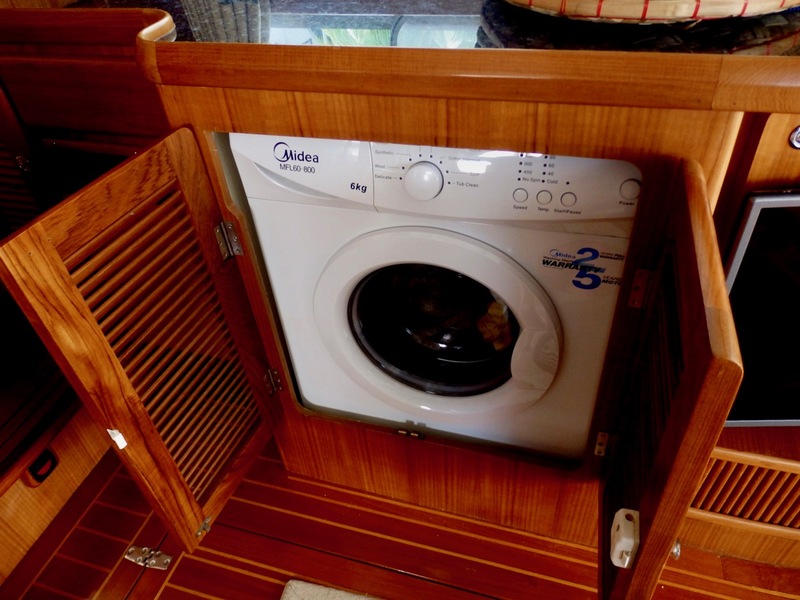 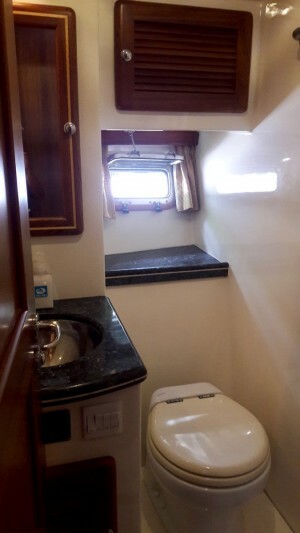 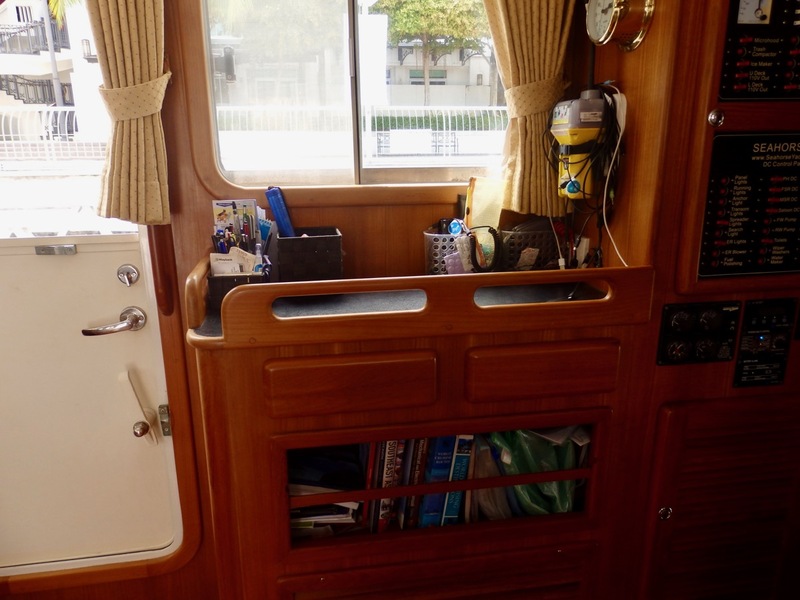 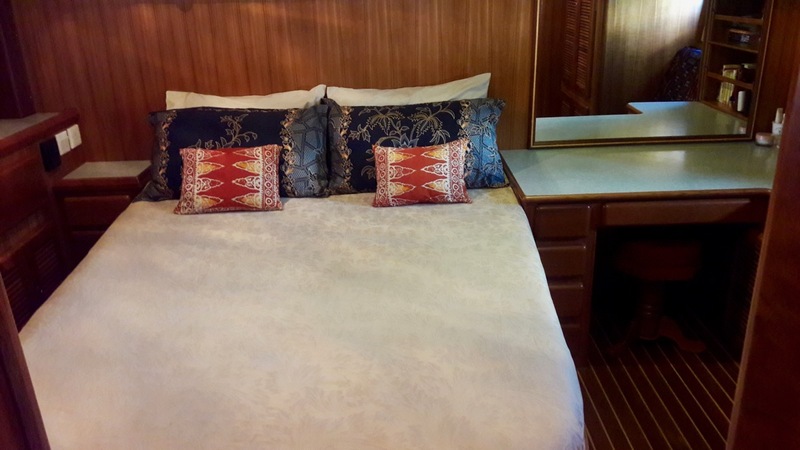 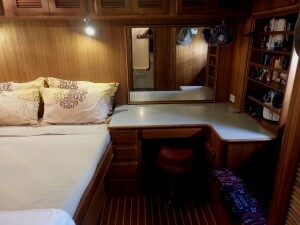 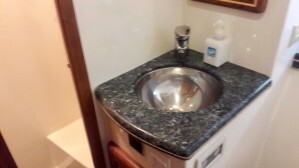 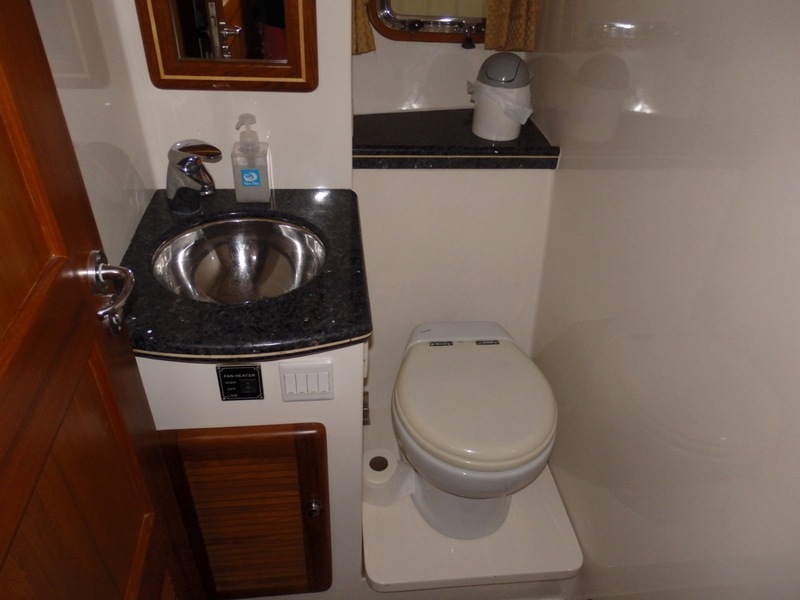 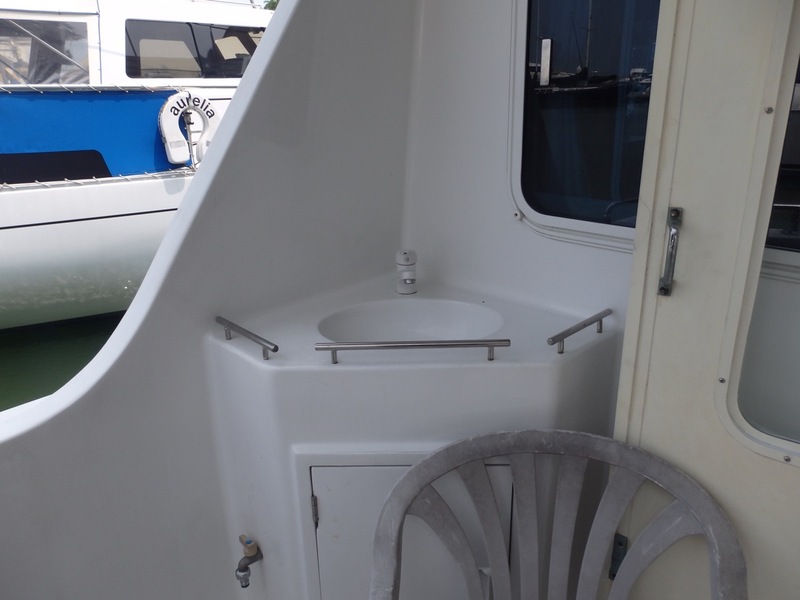 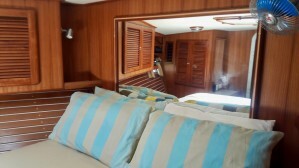 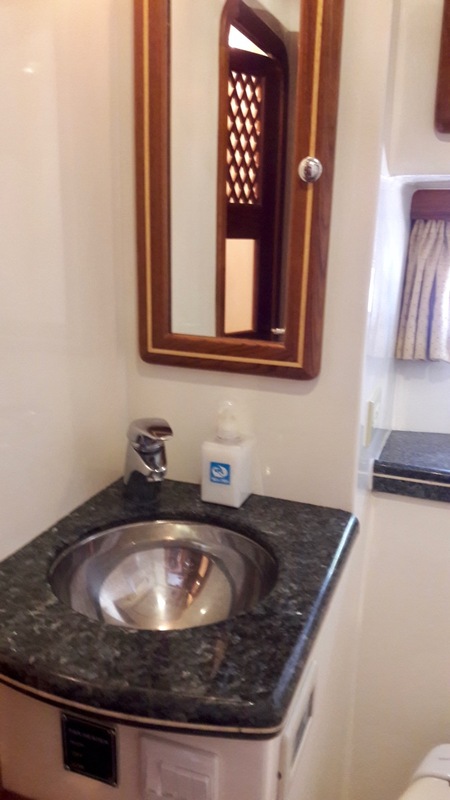 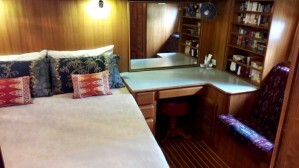 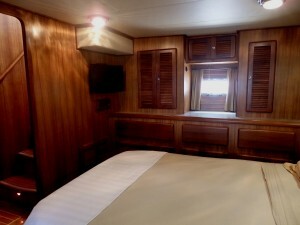 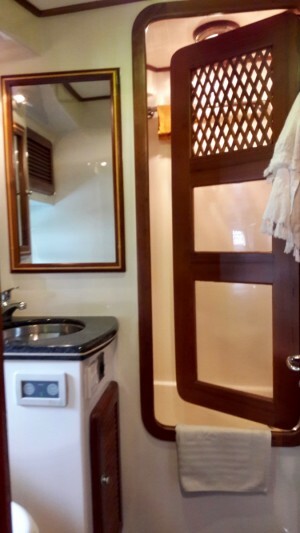 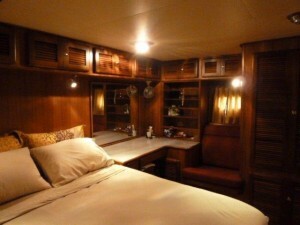 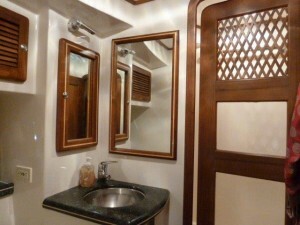 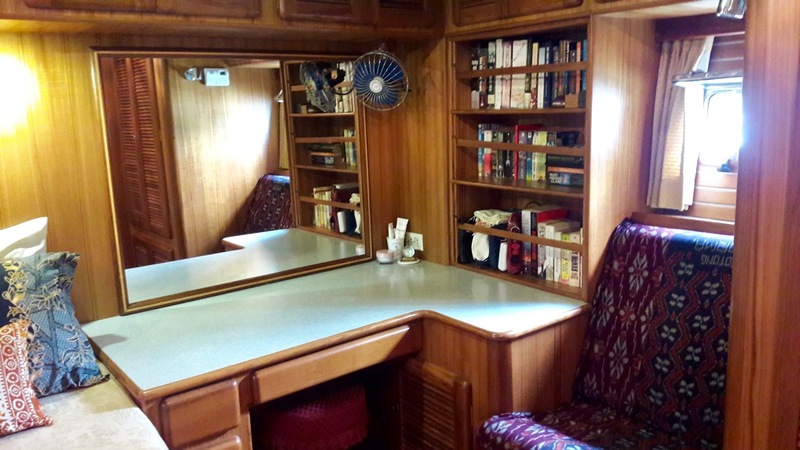 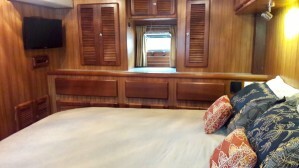 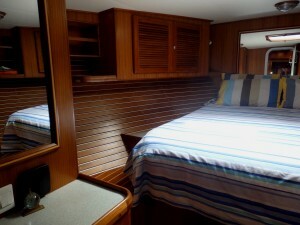 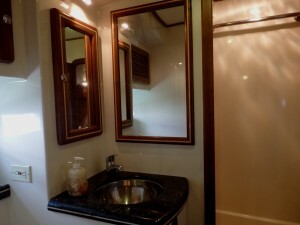 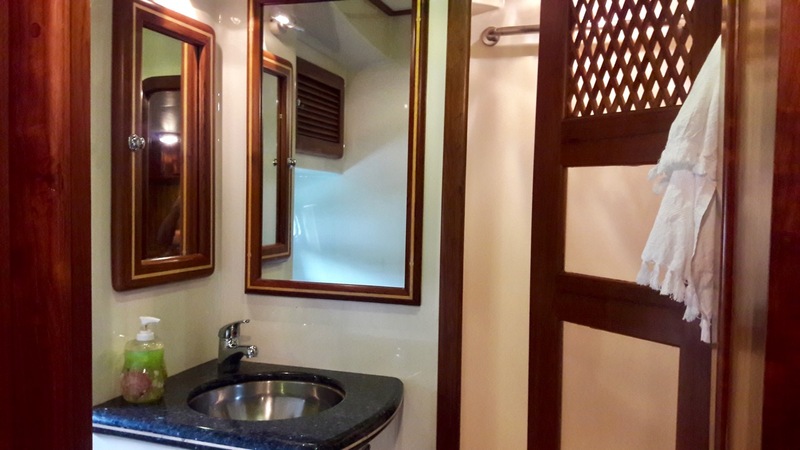 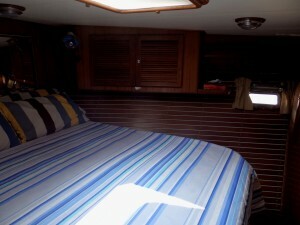 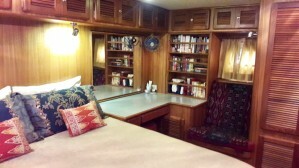 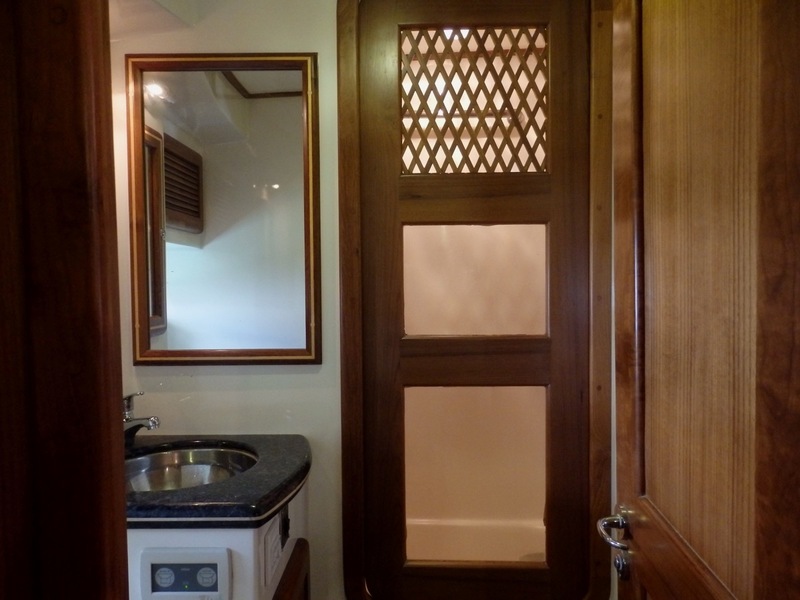 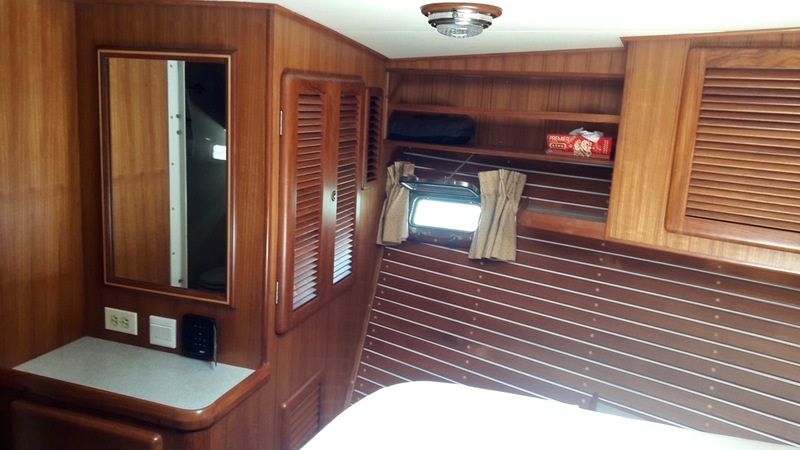 Aft is the master cabin, with its island Queen size berth with plenty of space all around, a Corian topped vanity/desk with bookshelves and mirror to port, and an ensuite freshwater TECMA head with shower/tub also to port. 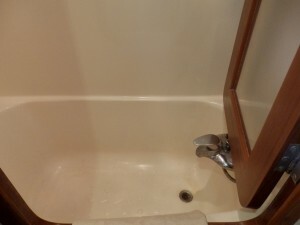 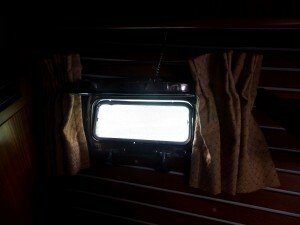 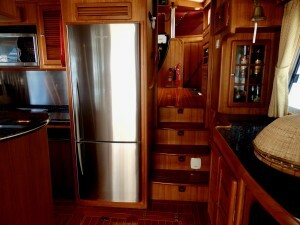 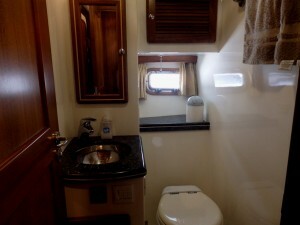 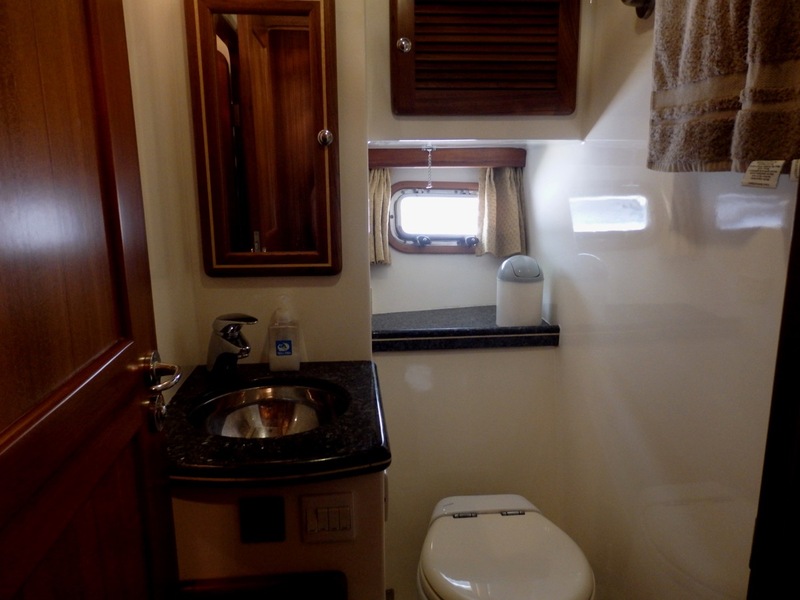 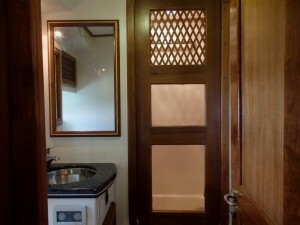 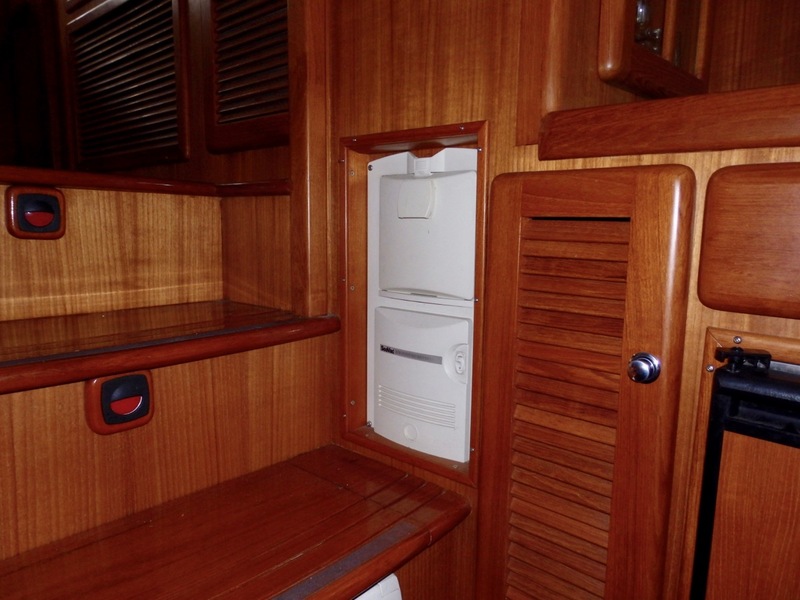 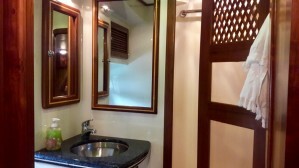 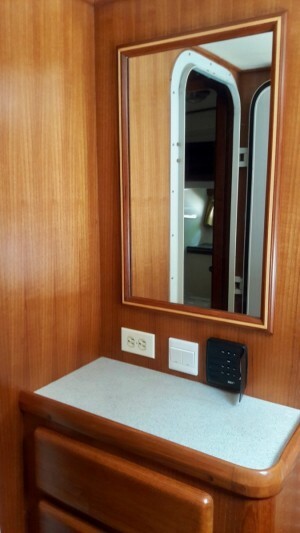 The cabin features remarkable storage, a large mirror, a vanity stool, and opening port lights either side. 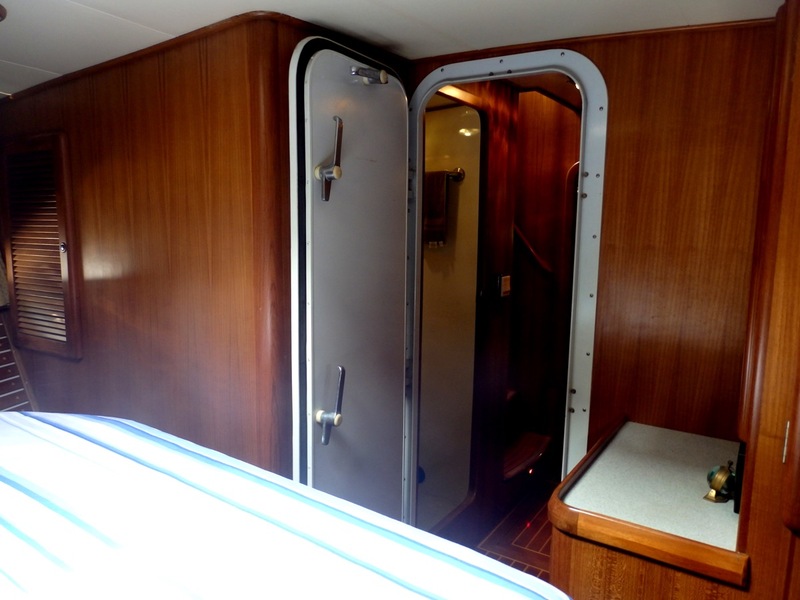 It also has a CO2 gas detector close by the bed. 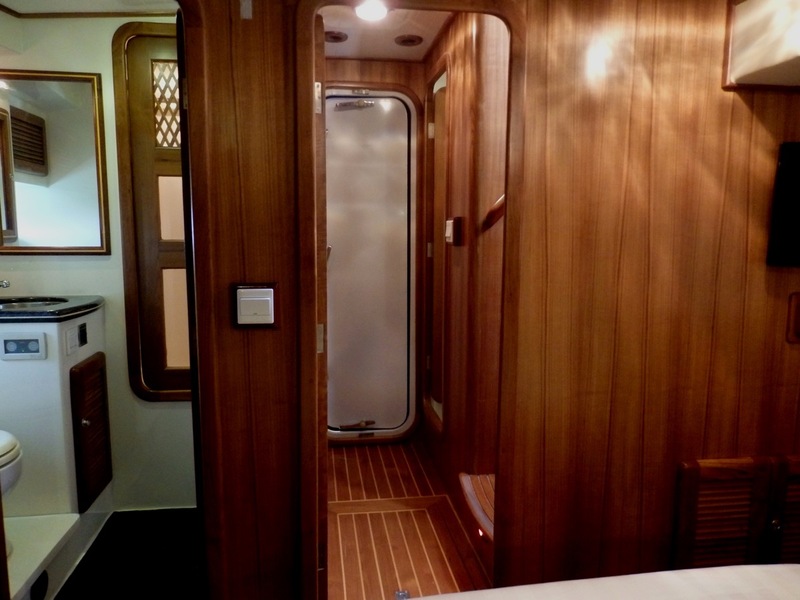 Moving forward in the passageway, the day/guest TECMA head is to starboard, again with shower stall, and forward into the guest cabin with full Queen size bed and large, ample storage, Corian topped and mirrored vanity and mirrored headboard. 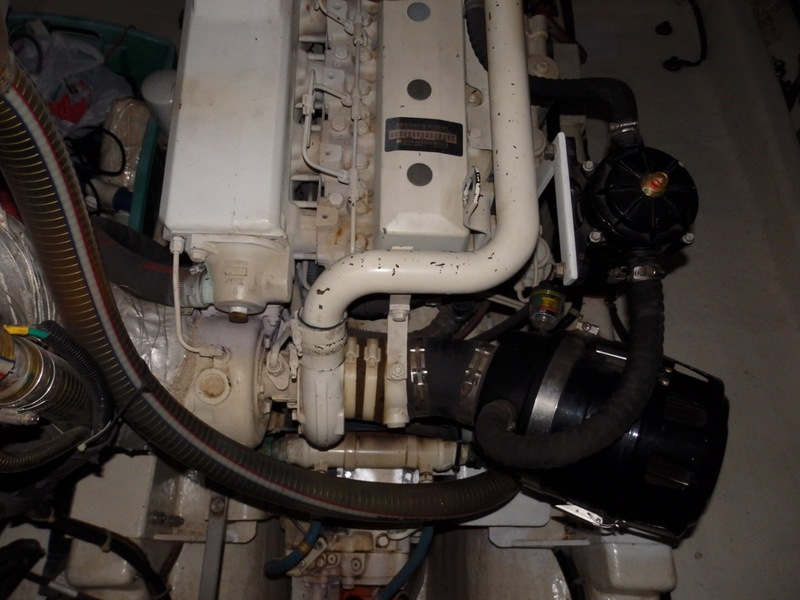 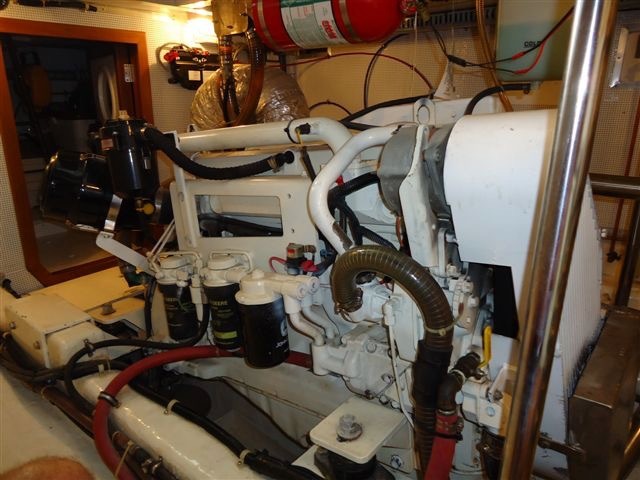 Main engine is: John Deere Model 6068 TFM75, 225 HP, fresh water cooled, wet under water with bypass exhaust, fuel filters, flexible shaft system and KE4 electronic control with access all around. The engine is known for quiet reliability. 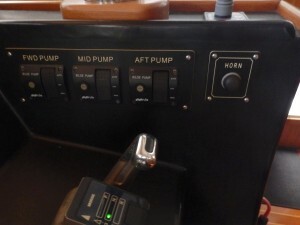 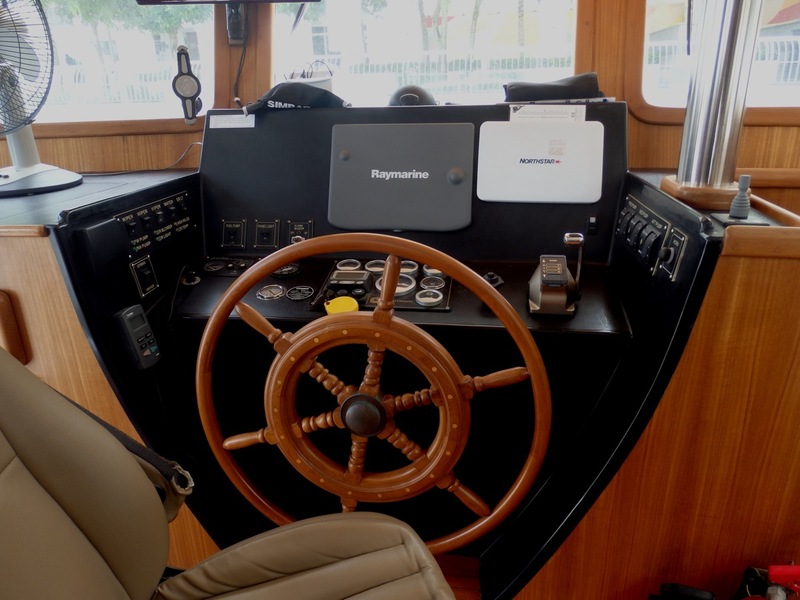 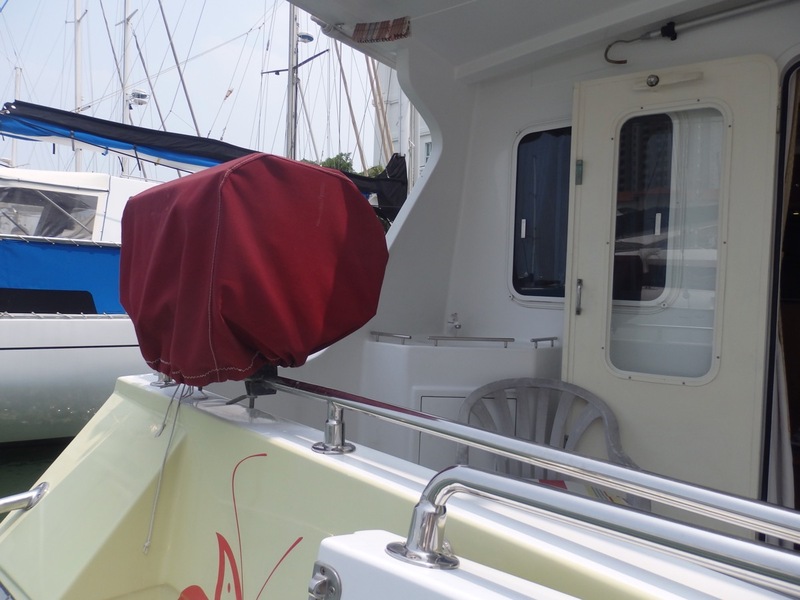 The noise level in the pilothouse is remarkably low, in part due to acoustical insulation with lead insert surrounding the engine room, and a 4 bladed propeller. 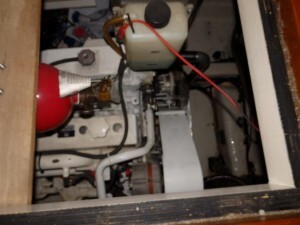 There is deep bilge below the engine, and an oil pan with oil overflow trap. 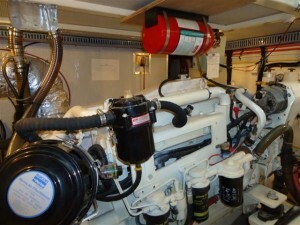 -Northern Lights generator, with sound shield, gas/water separation for quiet operation. 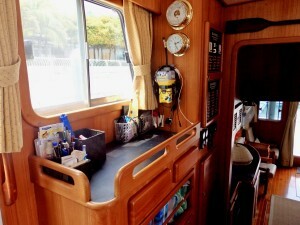 2182 hours. 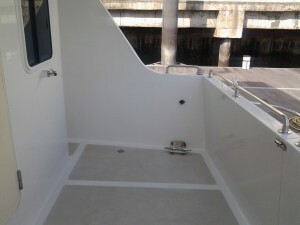 -Large FRP fuel tanks, baffled, with fueling spillage containment at deck fill locations. 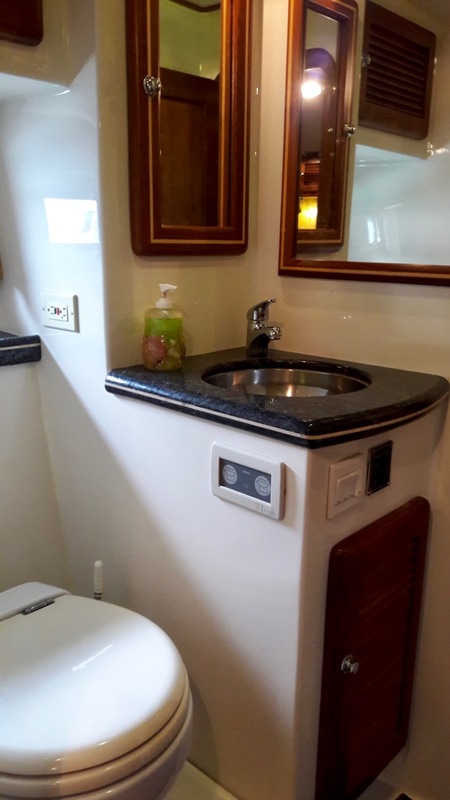 -Three units of Cruisair all-in-one air conditioning: 1 x 16,000 BTU for Salon; 1 x 16,000 BTU shared by Pilothouse and Master Stateroom; 9,000 BTU for Forward Stateroom. 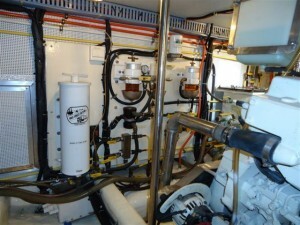 -Webasto DBW 22010 zoned hydronic heating system with 5 heat registers. 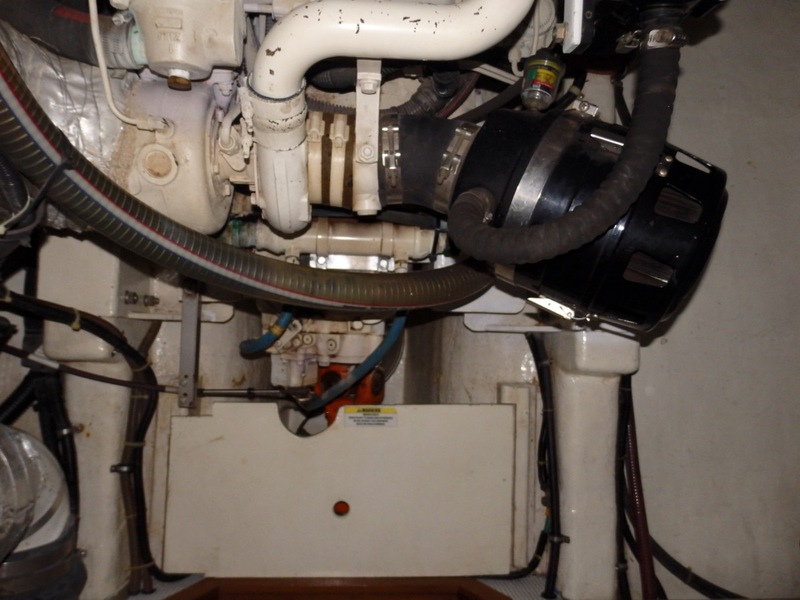 Note the neatly detailed plumbing installation of the system in the engine room. The furnace is located in the lazarette to reduce noise levels. 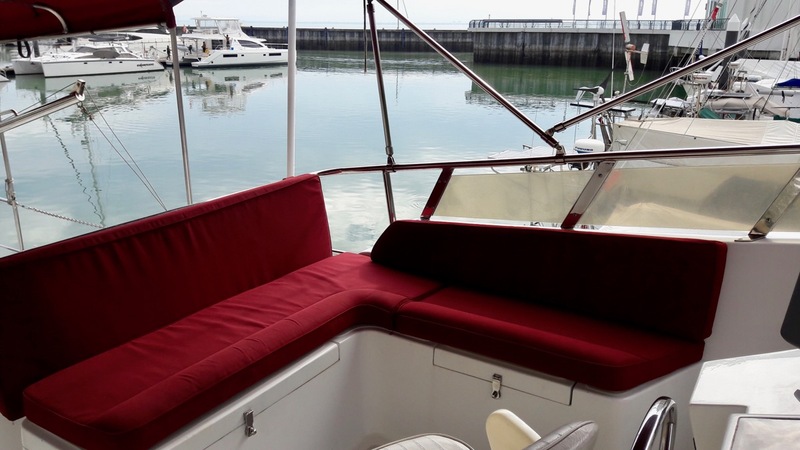 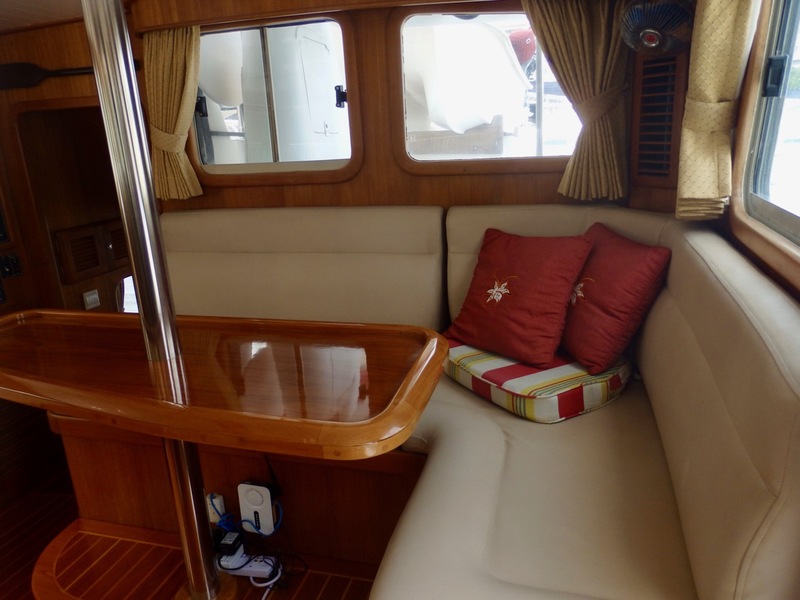 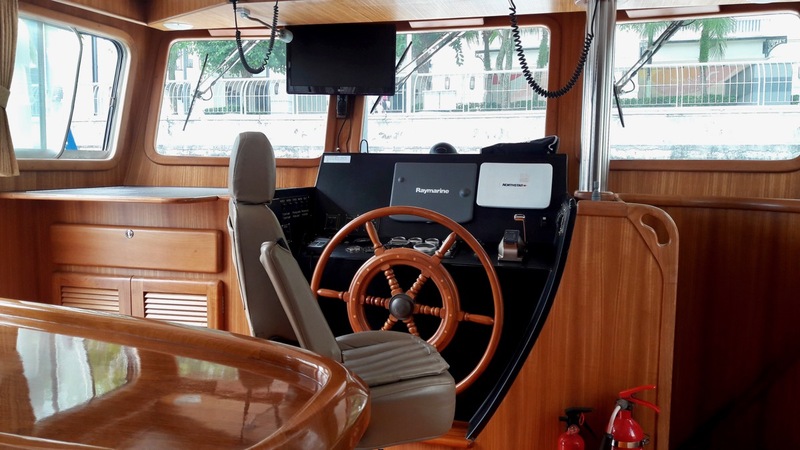 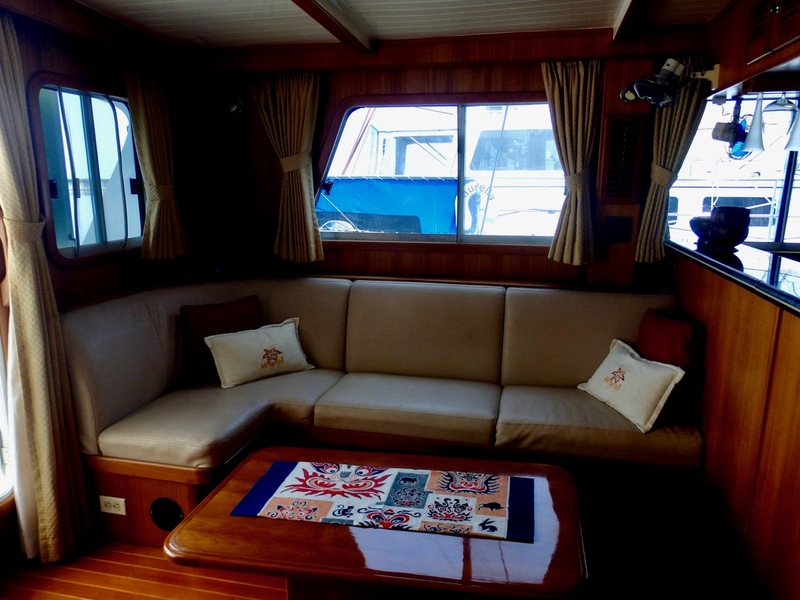 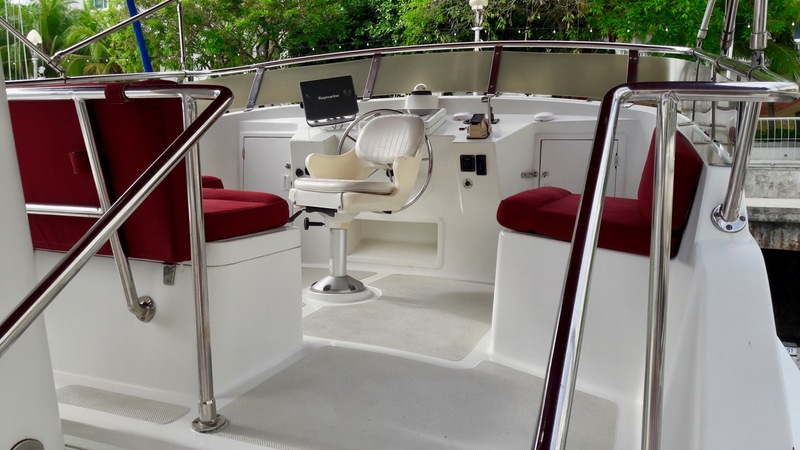 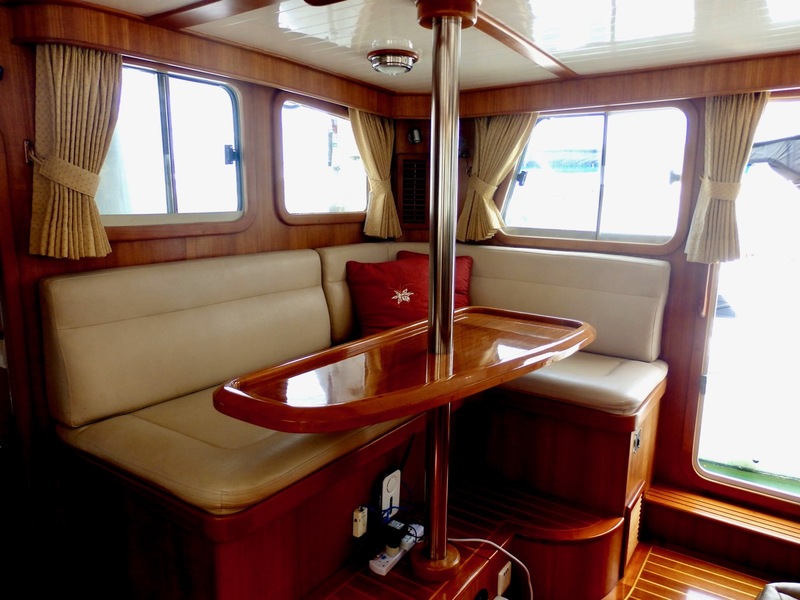 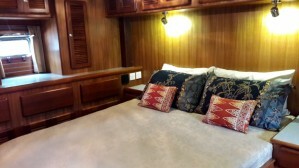 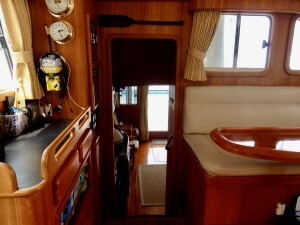 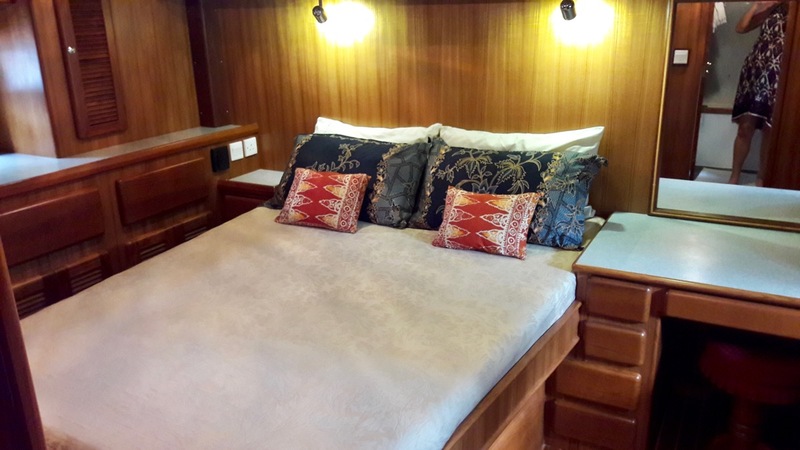 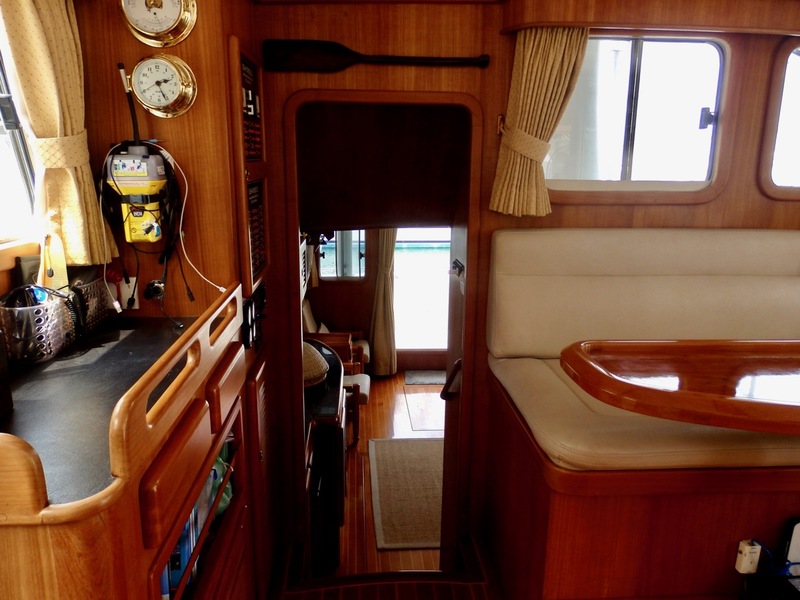 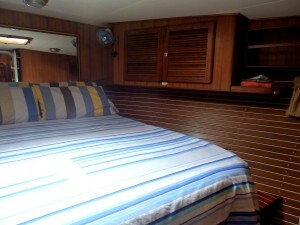 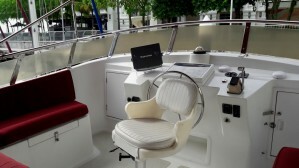 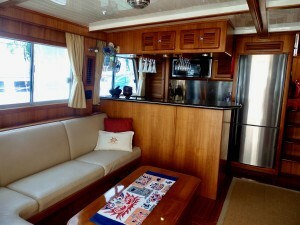 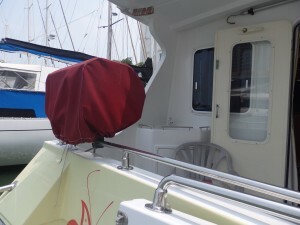 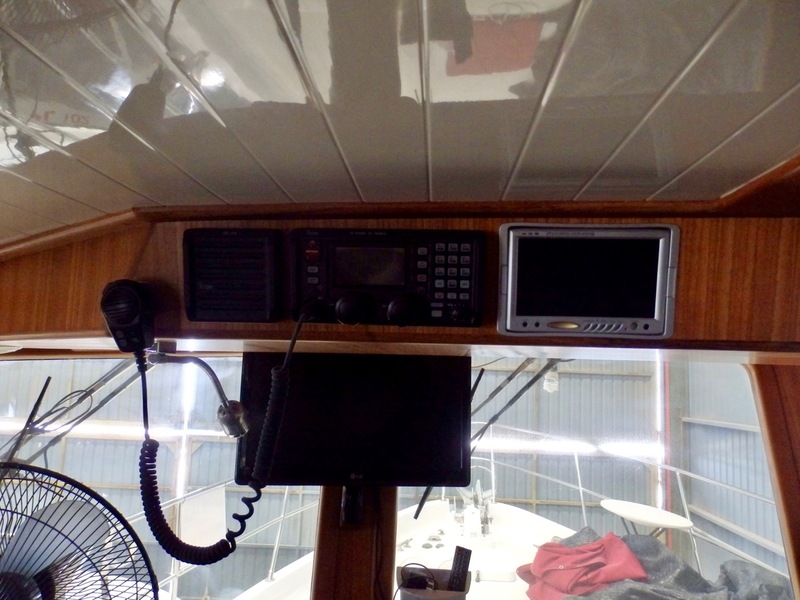 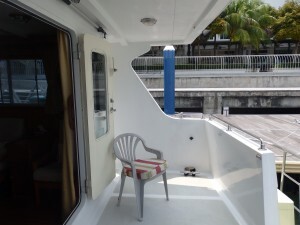 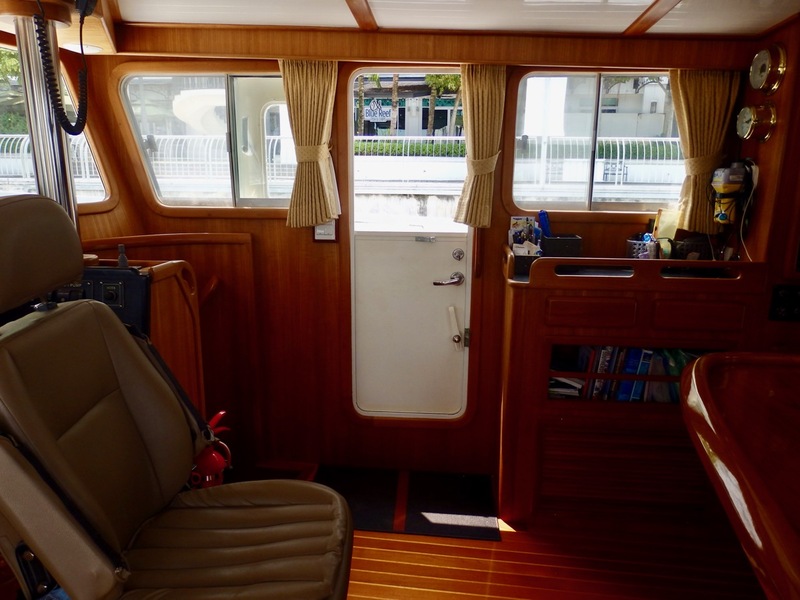 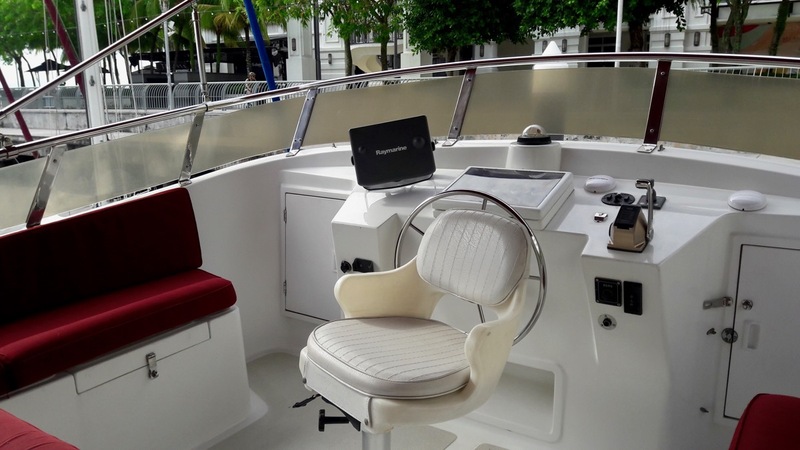 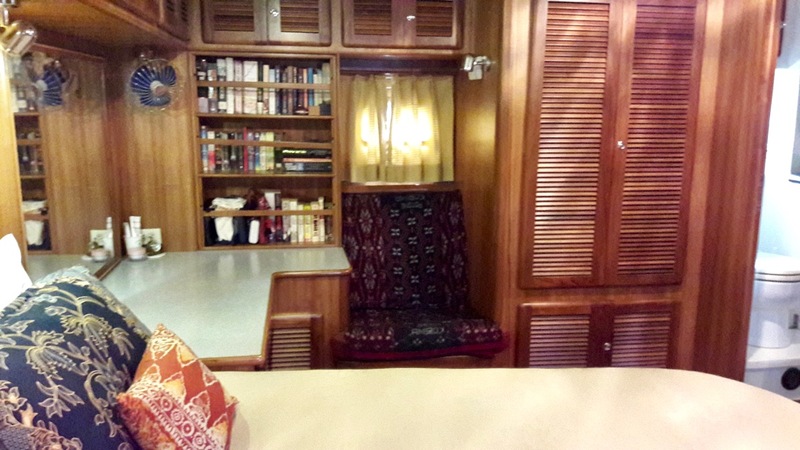 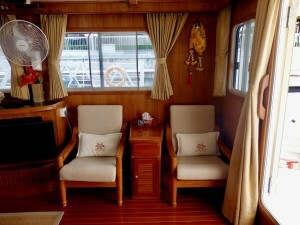 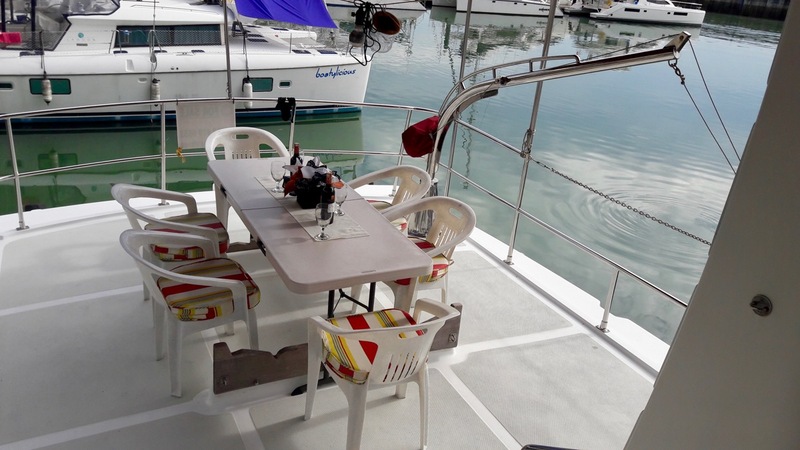 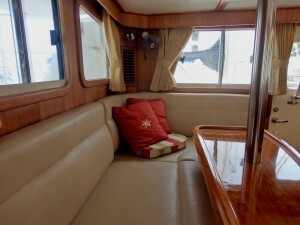 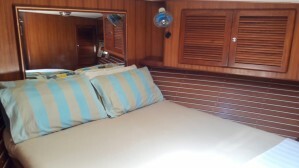 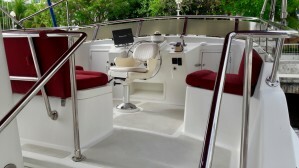 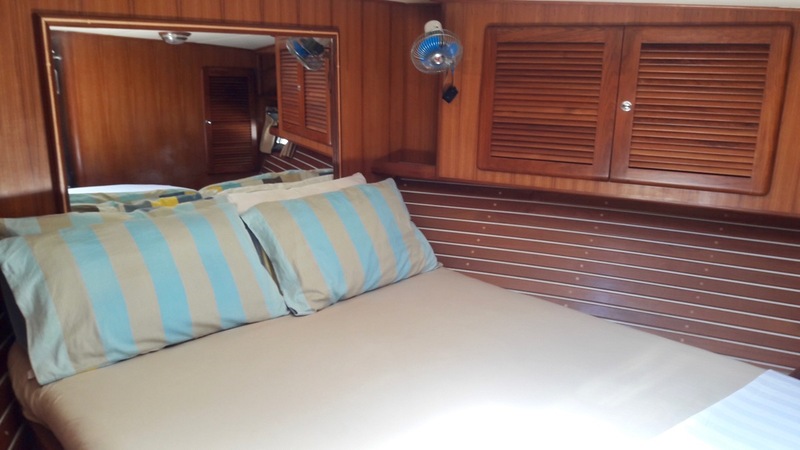 The command centre of the boat offers great all round visibility, a beige leather L-shaped couch which doubles as a daybed, and a very functional teak table. 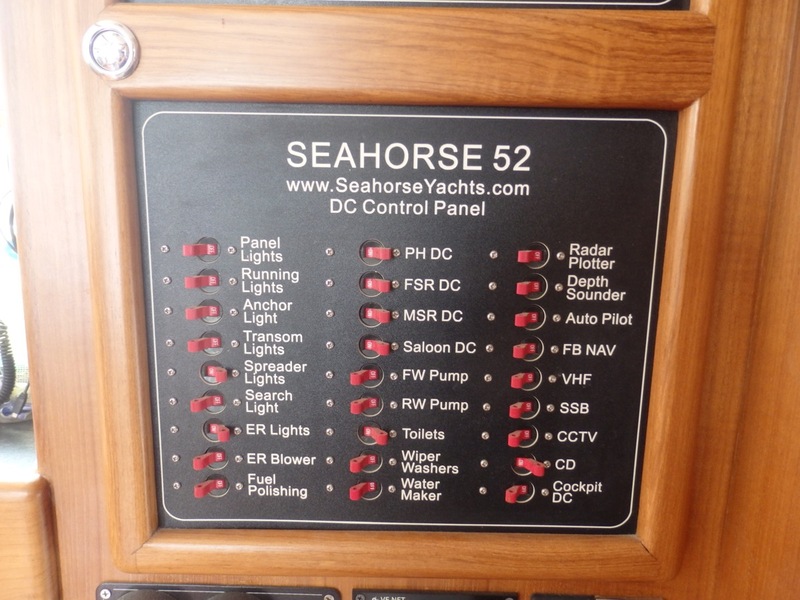 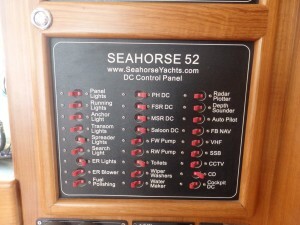 The electrical control panels and breaker panels are to starboard, with the panels high, easy to see and with large labels on each breaker. 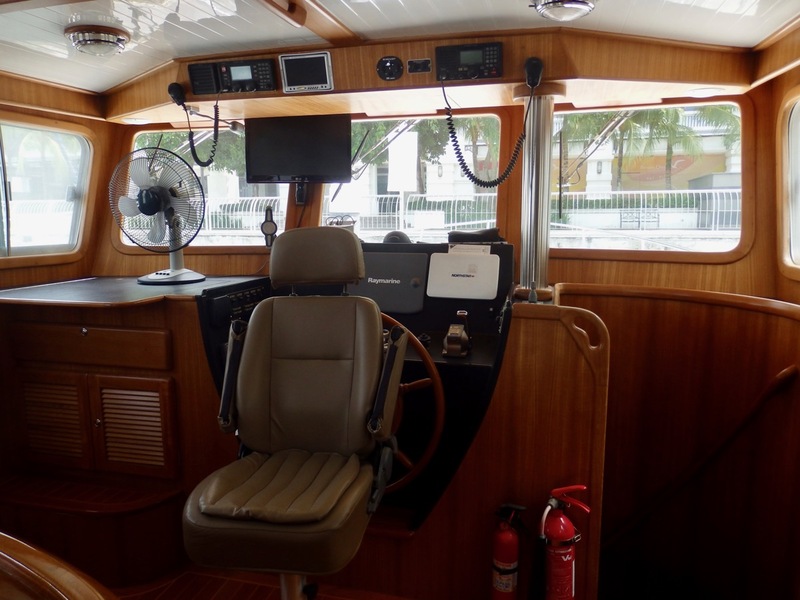 Cruising guides fit neatly into the boat shelf, and the impressive helm dash and overhead instrumentation instantly grab attention. The array of gear is logical, balanced, well thought out and properly wired and installed. 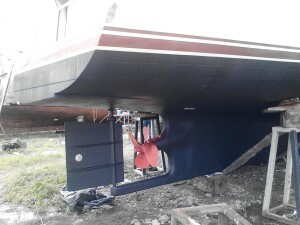 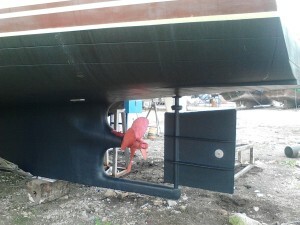 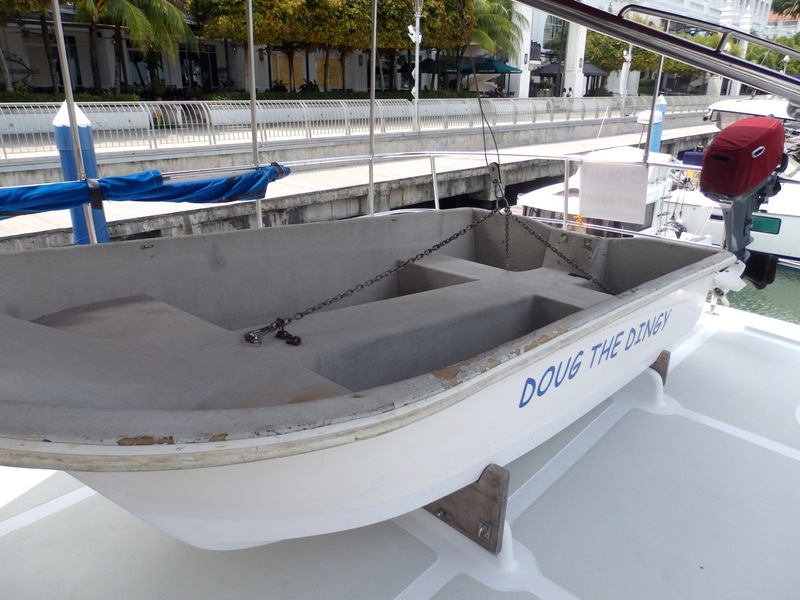 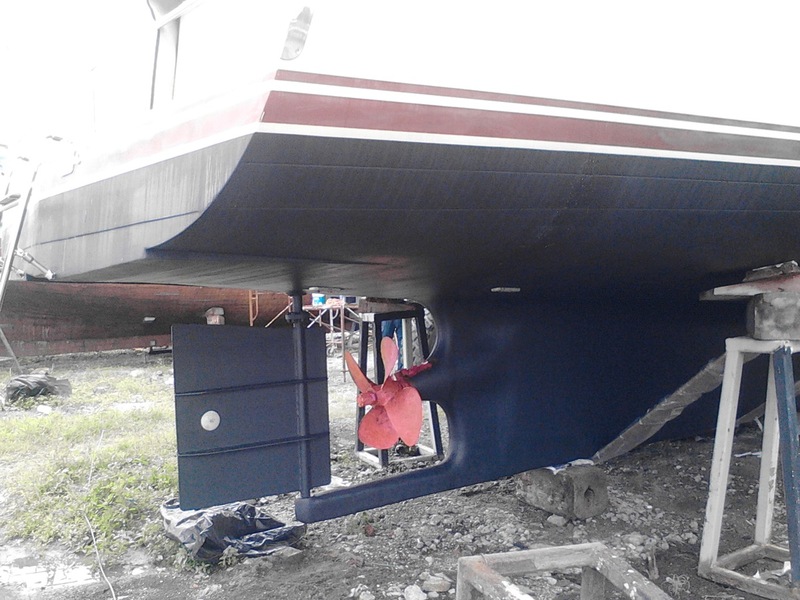 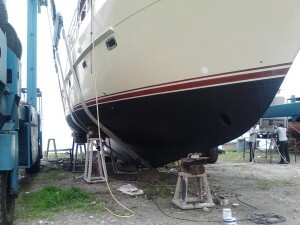 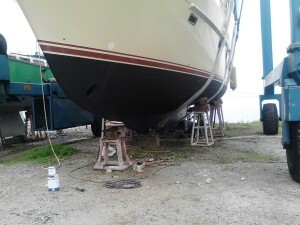 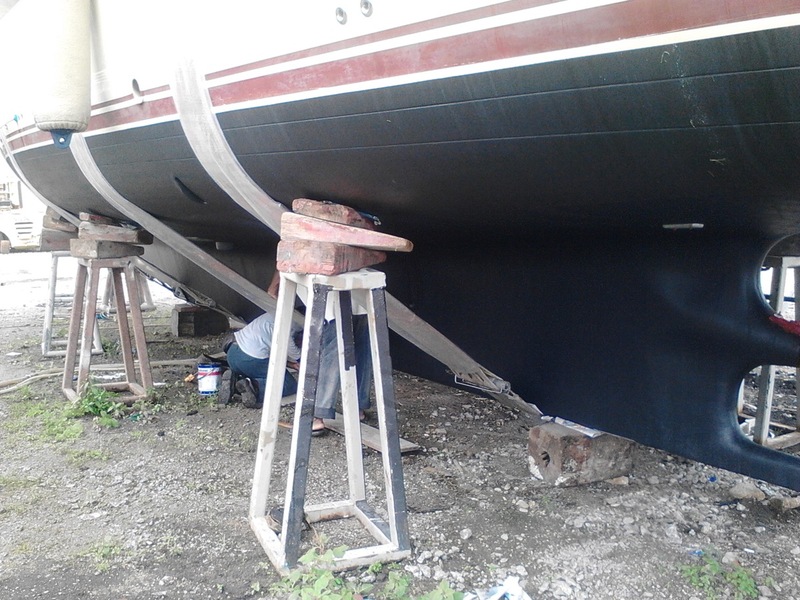 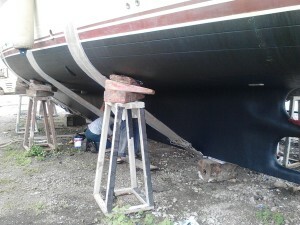 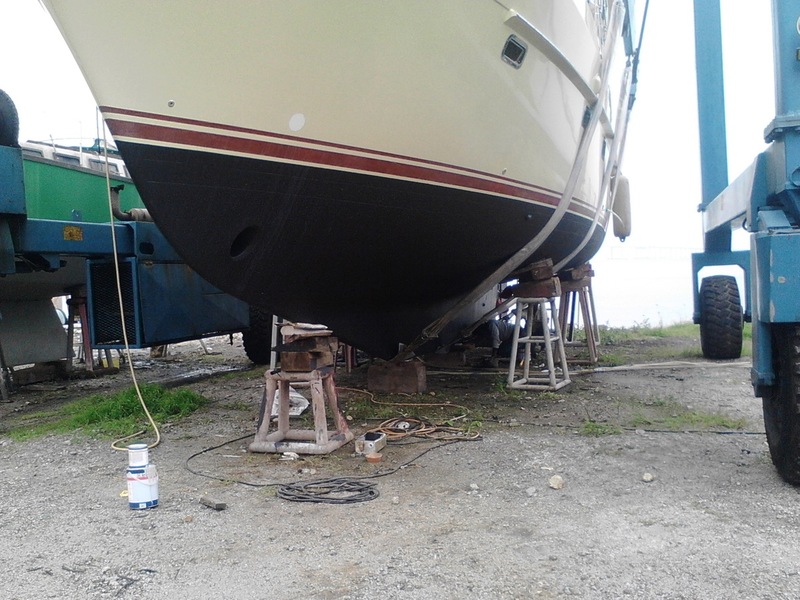 Powder coated doors open starboard to walkway, and on the port side, lead to the boat deck and fly bridge. 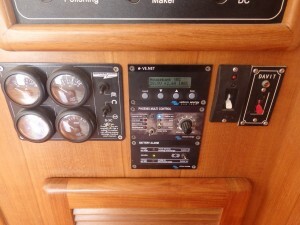 -Muir HR2500 24V electric windlass control and chain counter with power up and down. 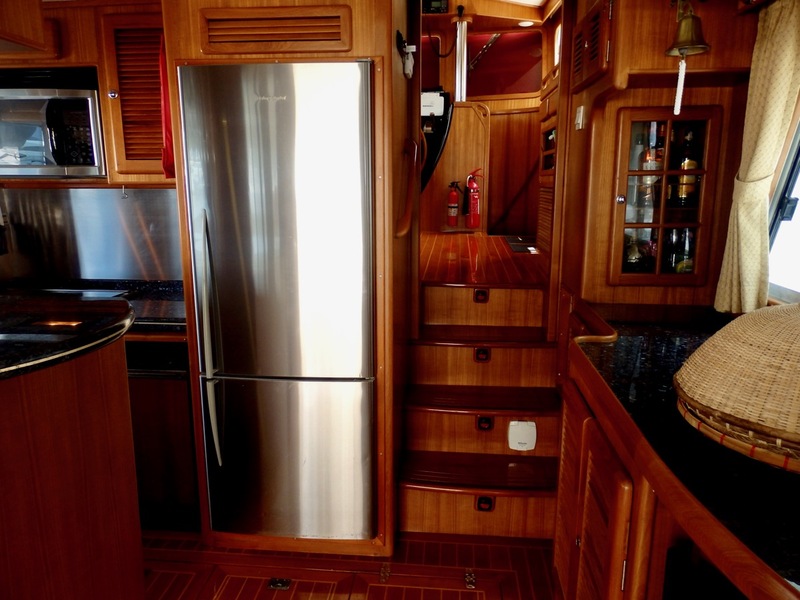 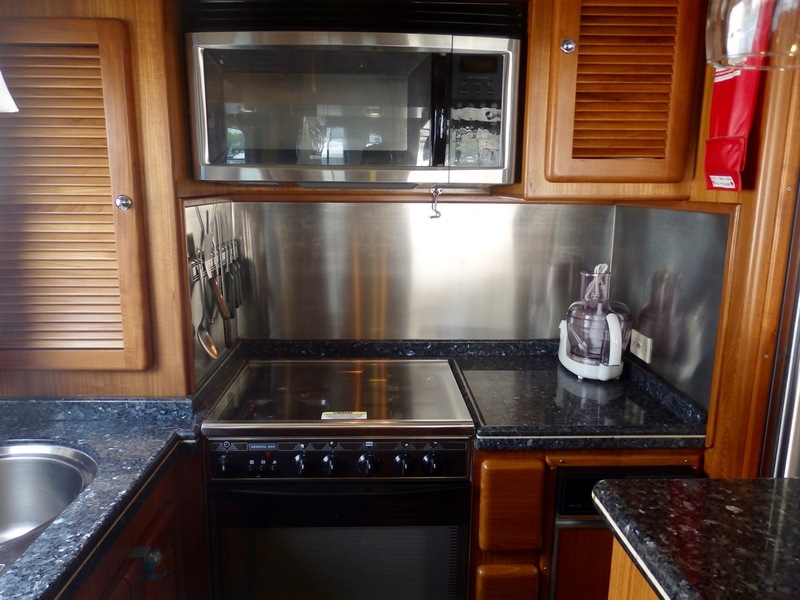 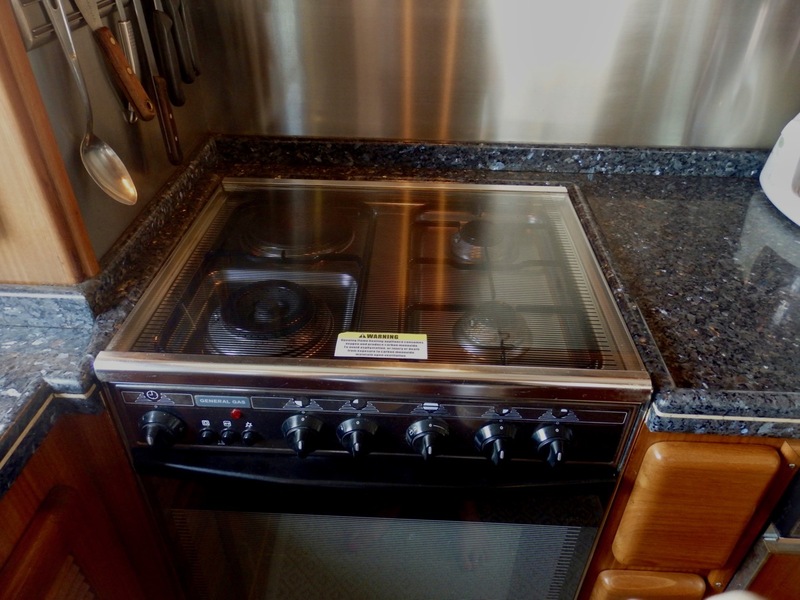 The galley provides amazing work spaces and storage, and is complete with appliances, stainless steel in finish, a stainless steel back splash to the stove, and a double SS sink and not forgetting the full size fridge / freezer. 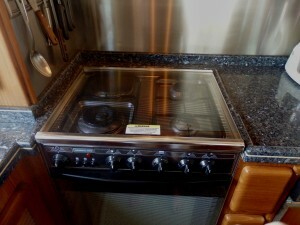 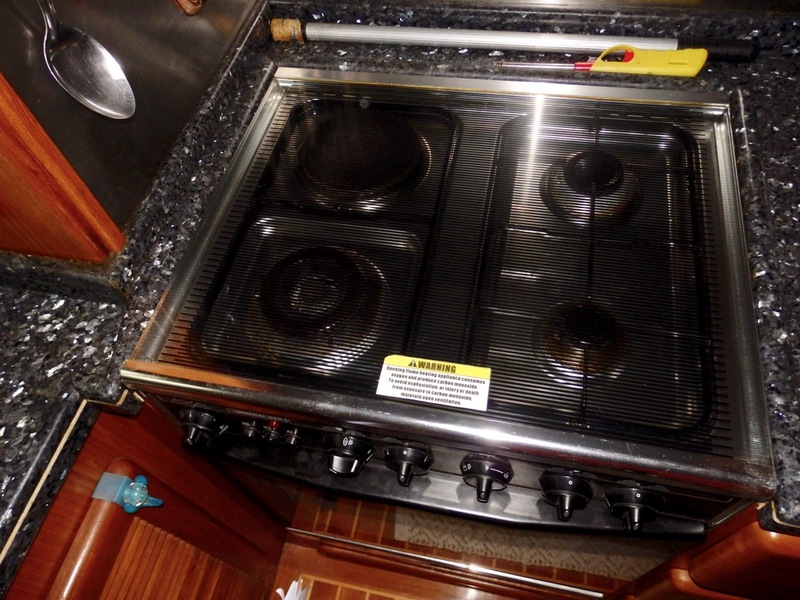 -Force 10 marine 4 Burner propane stove and oven. 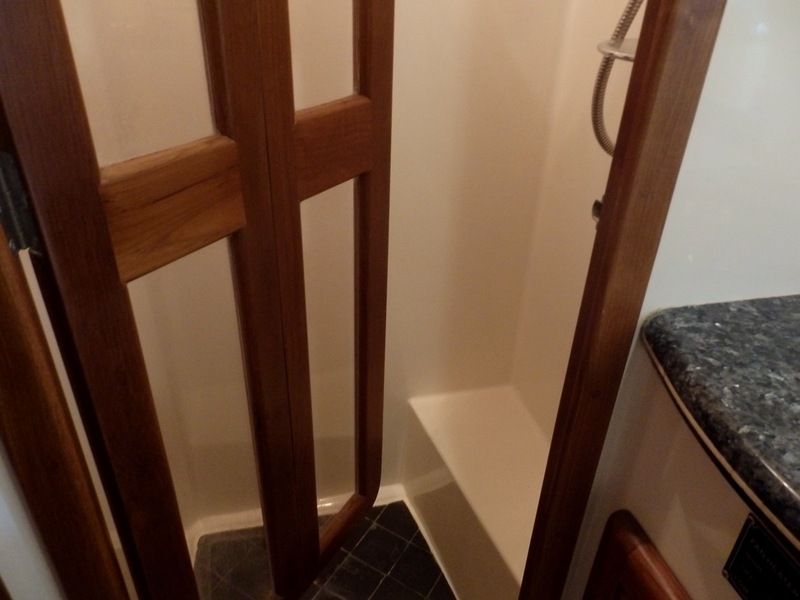 One of the safest units available, and highly regarded. 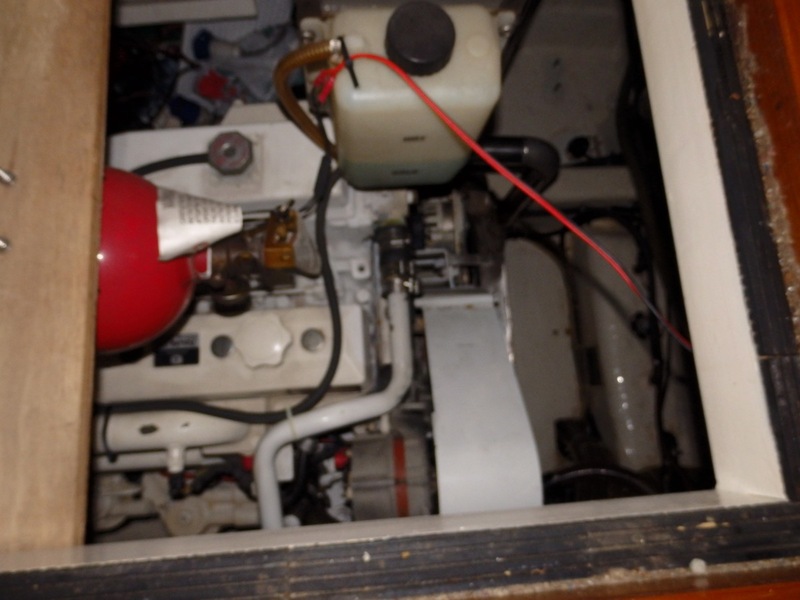 Propane tank in a locker on the forward deck. 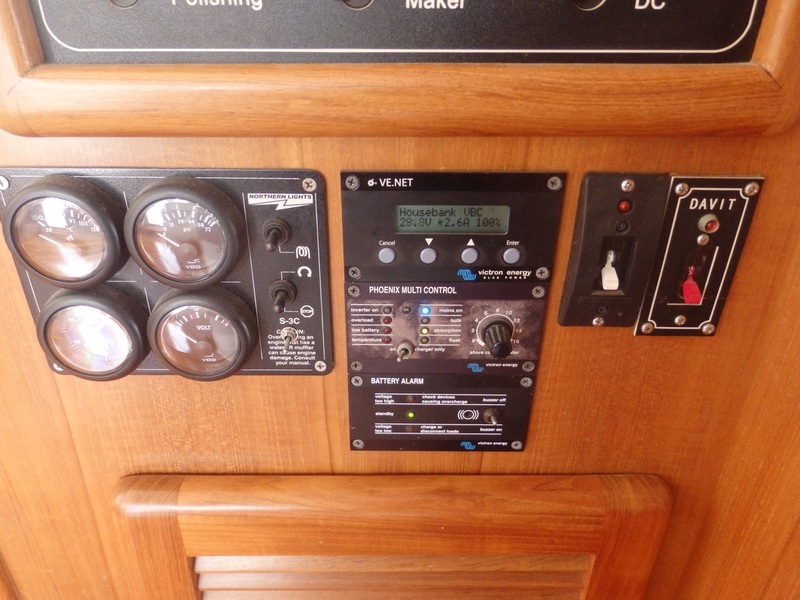 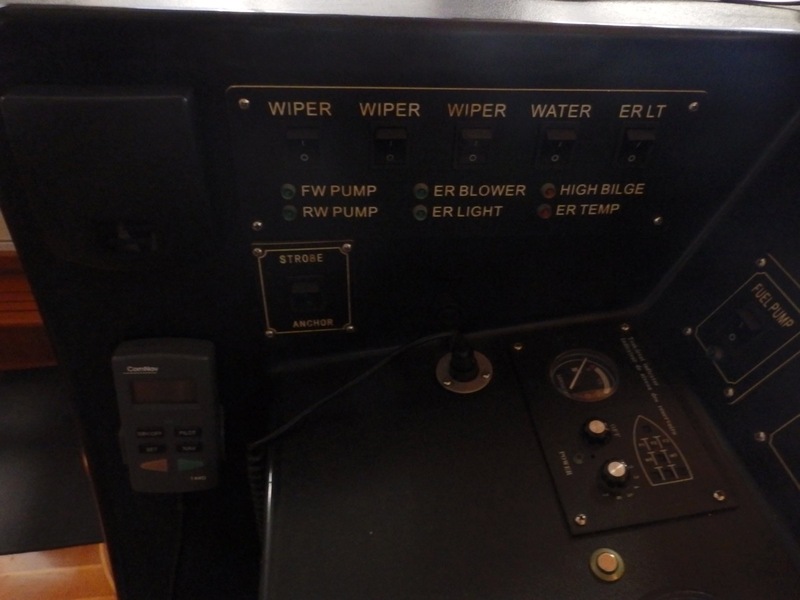 -9 KW Northern Lights genset, Sound Shield, quiet exhaust with water / gas separation, and Deluxe remote panel in the pilothouse. 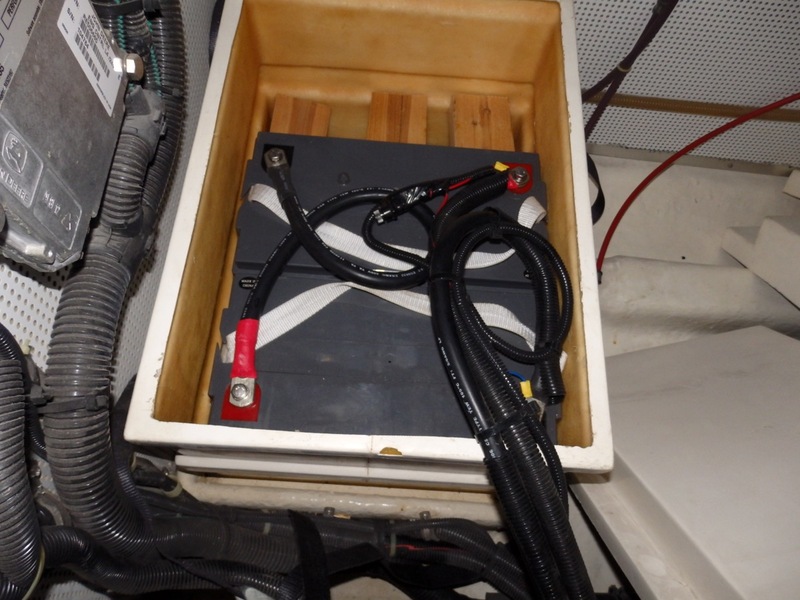 -8Kw Isolation Transformer to protect from low voltage, fluctuations, eliminates the need for a galvanic isolator. 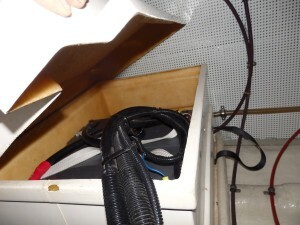 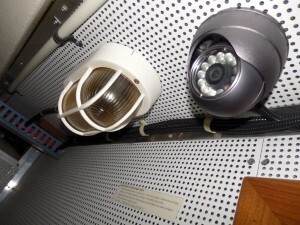 The unit provides 120VAC to the ship, up to 50amp service. 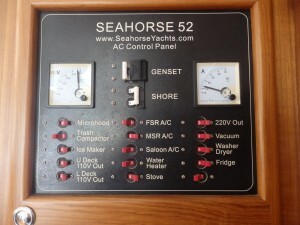 -Shore connection plug 220 VAC - 50 amp. 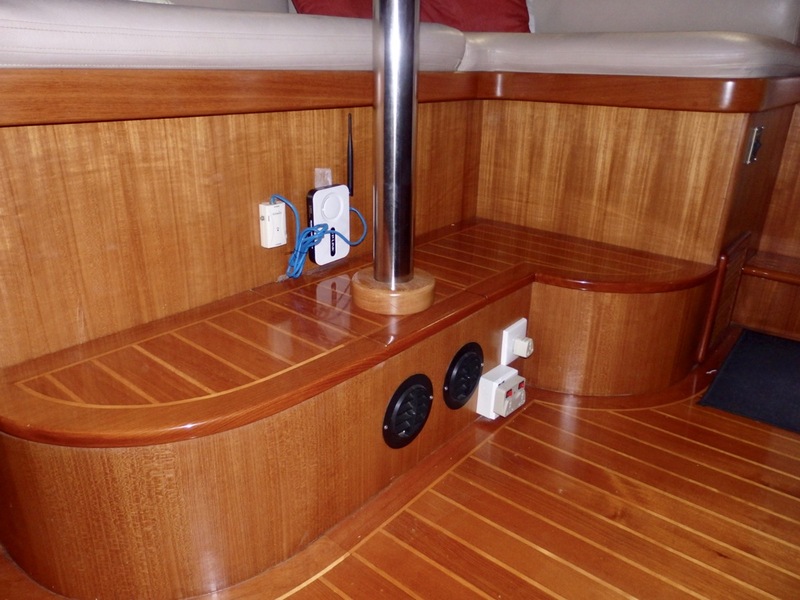 -Wiring is tinned copper multi-strand marine grade, colour coded and marked for identification purposes. 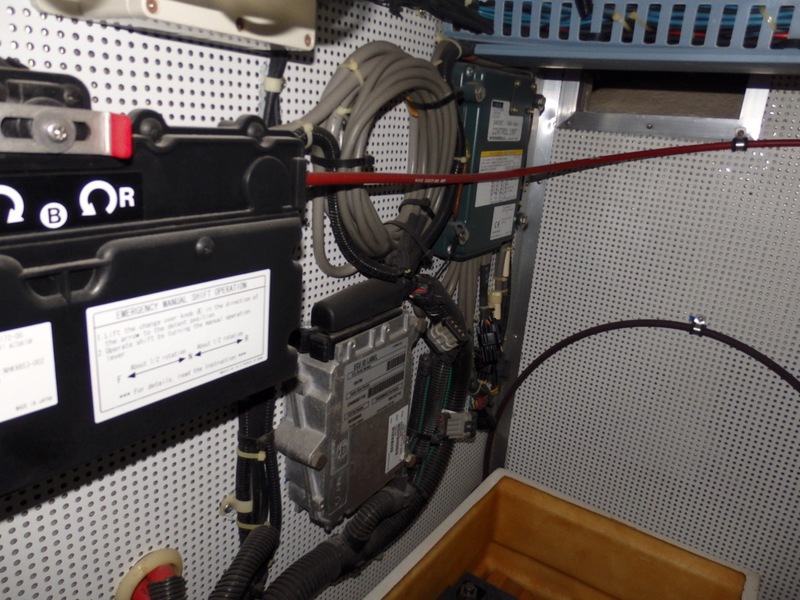 A locker below the panels gives ready access to this impressive wiring/coding layout, and also contains GFI breakers in one convenient location. 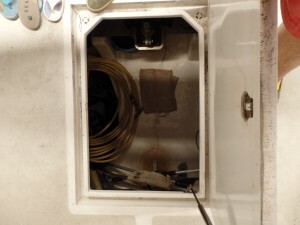 -Two water tanks, total 300 gal.